The 2013 season is slowly going to an end on this site of the world! LIVNO..place to be for the future???! Not long ……and the 2013 season is over. The metrological autumn will start this Sunday here and spring down under! Looking at Holland this summer was not TOO bad. According to “weather-on-line”, spring was cold, June still not as it should be , BUT summer was good with an average of 17.5 dgr. C , about 0.5 more than normal and will go in the books belonging to the warmest summers since 1903. At the moment the weather here is still perfect. Yesterday several flights were flown over 600 km here in Holland ; one in the DUO with dad Ferdi and son Casper Kuijpers in it. They found the weather MARVELLOUS in their comment. Rieti still has over 700 km. 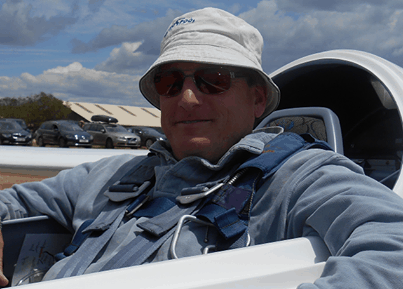 flights and from the EAST of Australia kilometer-eater Alan Barnes flew already 577 km in the 18 m. LS 8. The last competitions have been held and quite late in the season there were still a few. 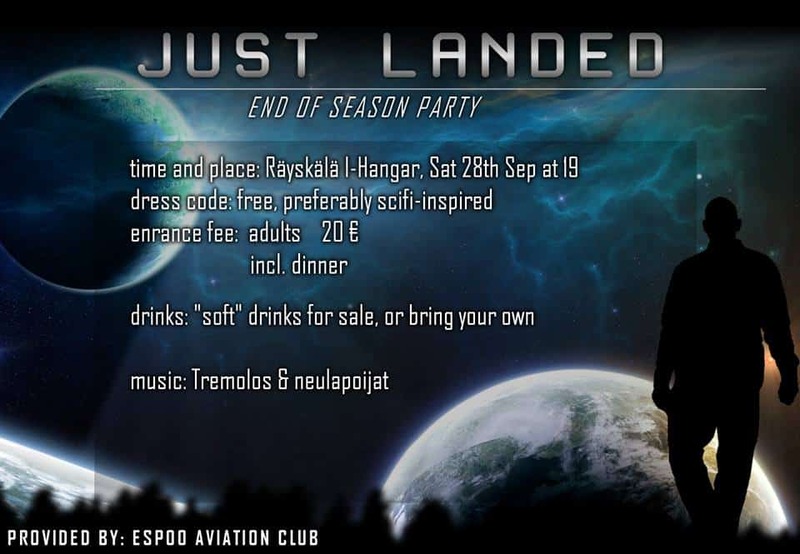 Some end-of-the-season-parties are announced already , this one from Rayskala and posted by Katja. Great very- early-spring conditions already down-under in Kingaroy and sometimes you see a glimpse of autumn here in Holland. Early spring as seen and shared by Adam from Kingaroy. Foggy early morning conditions as seen by Jeroen in Holland [Malden] . 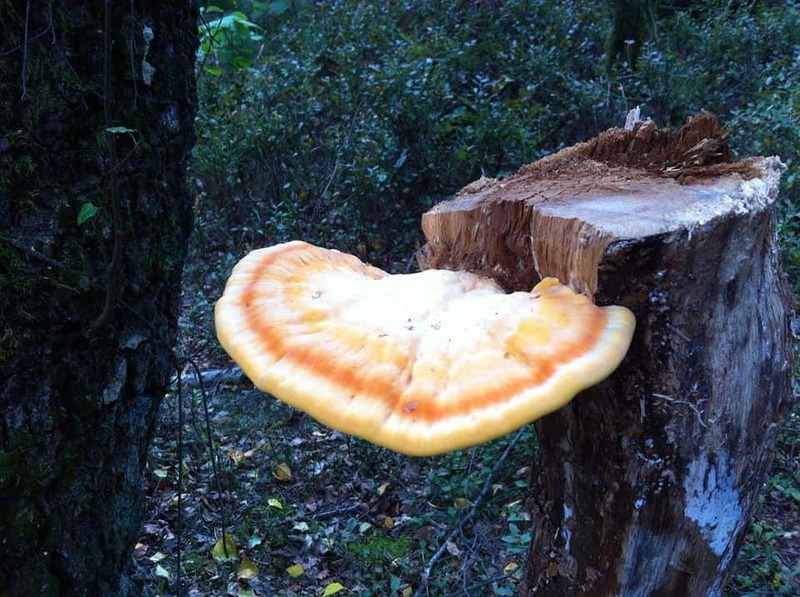 And early toadstool as seen and shared by Max in Holland. Better go quickly to some of those comps. I guess you can call a day with an average speed of 130 km. /h. during a National Competition , in the Discus 2 ax, a pretty GOOD one. 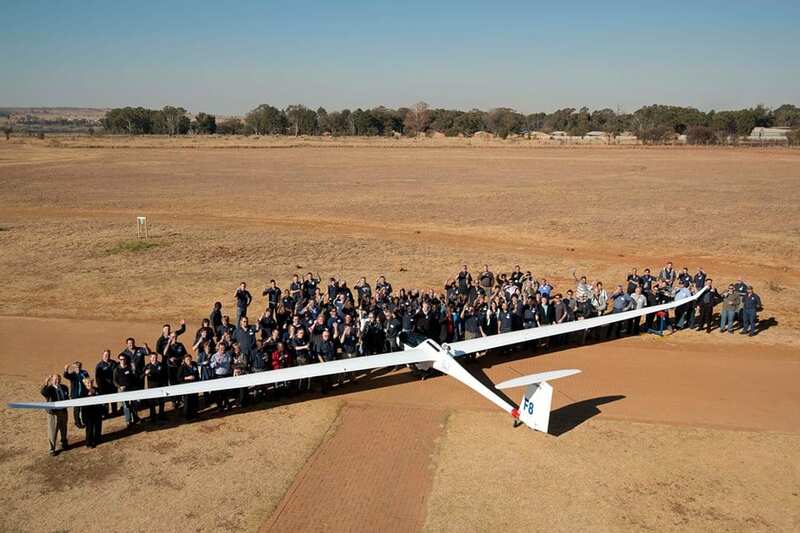 Patrick Puskeiler flew that speed over 322 km. on the last day in Lüsse! The day before was not bad either ; a 3 hour AAT with best distance [336,9] and speed [109,43km./h] for Markus Schieber. As said before the day-winners were every day different. 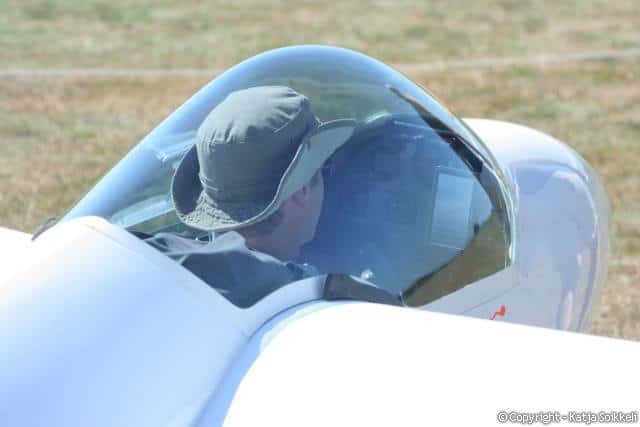 In club class Wolli had a great 3 hour AAT being 2d on day 6 , flying 283,6 km in the HPH 304 C in 301 and on day 7 , the last day, the LS 1f was the best over 279 km. 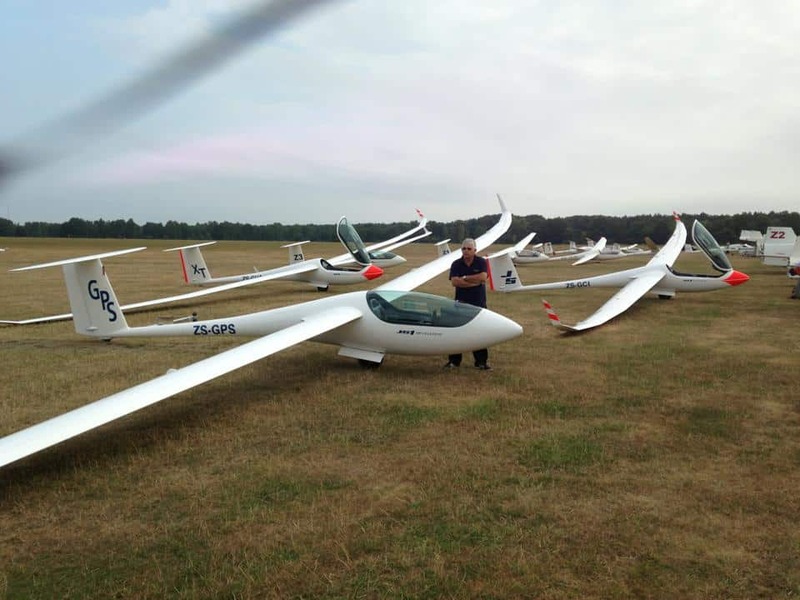 With 7 out of 10 days ,the new German Champion in Standard class was Jan Omsels [ 5658] who had that great flight on day 5 gaining nearly 200 points on the rest, that WAS another “weird ” last day!!!! Runner up was Mario Kiessling “SUPER MARIO ” [5636 ] both in Discus and on spot 3 a Dutch young and talented pilot Alfred Paul Alfers in LS 8! Champions and winners in standard class and club class. As shared by the official site! In Club class it was Thomas Melde [ 5111] before Kai Glatter [ 5084] both in St. Libelle and on spot 3 Helmut Kölle [ 4978] also in a St. Libelle. Interesting, very interesting!! !Swaantje finished on spot 38. A St Libelle as seen last week at Keiheuvel airport! They had 4 days ,…..then only cancelled/scrubbed/canned days! So the UK National champion in 18 m.class is Russell Cheetham in JS 1. A pity that the pilots could not show more of their soaring, as the first 6 pilots are within 200 points, the first 11 within 300. But ,…that’s soaring!!!! As Graham mentioned on FB; “So the Nationals are all done for 2013, now the voting begins for the World’s next year. UK 18 m. National Champion Russell Cheetham. He was runner up a bit earlier in open class as well. Picture shared on the Jonkers FB site. 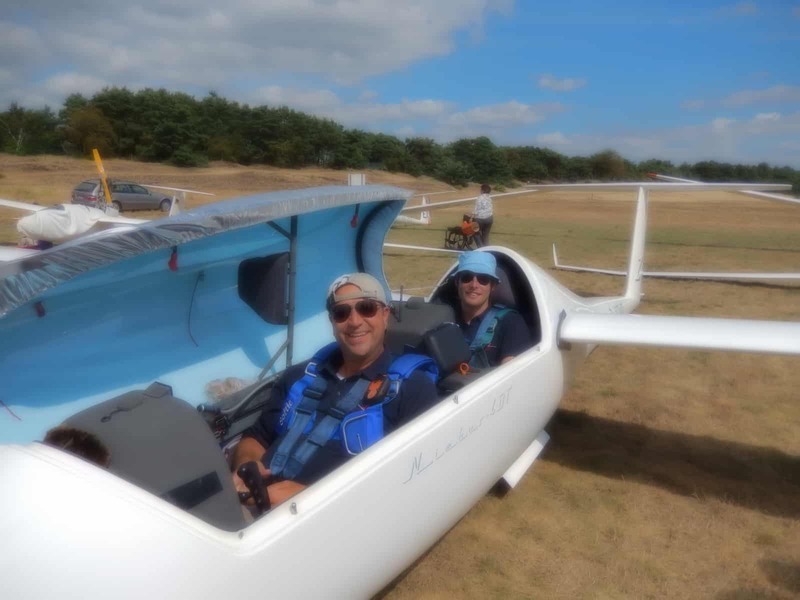 Team members Matt Davis, [St Cirrus] Sam Roddie [ ASW 24/15m. ] 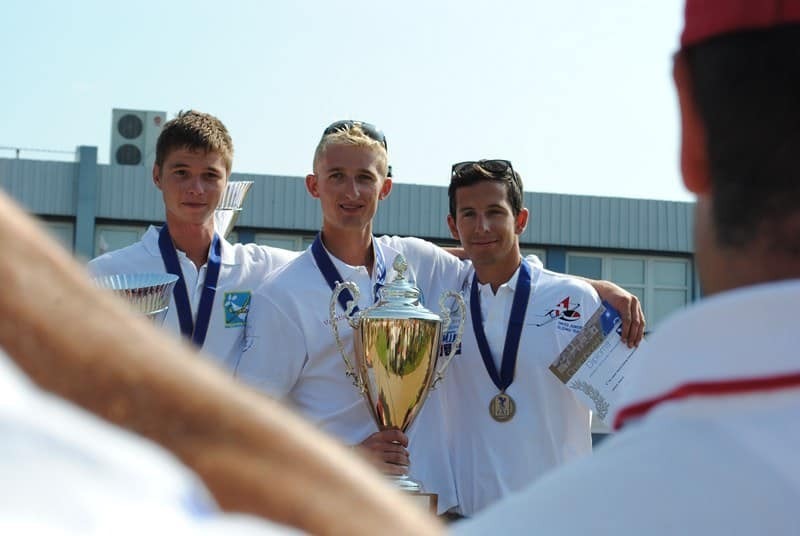 and Luke Dale [St Cirrus] were locking out the podium at the UK Junior National Championships after four flying days. Matt was nearly 200 points ahead on Sam, who still felt the “hot breath in the neck ” from Luke, as the difference was only 36 points. The rest was too far away to be on the podium. Friday was cancelled , so in the end they had 4 days of soaring and 4 days of “forced rest! La Roche sur Yon; The FRENCH JUNIOR Nationals . With 36 competitors and 6 days of soaring the French top juniors from the JWGC showed they are indeed the best. On the last but one day, the world champion Valentin Grit, was only 4 points ahead of the runner up during the JWGC, Benjamin Vades. Do you remember the difference in points from the final scores during the JWGC between Valentin and Benjamin ????? No here you are; 22!!!! Valentin won the last day by starting earlier than Benjamin at 14.26 . Over the 2.30 AAT he had a speed of 62 km. over 161.8 km. in the HORNET in time 2.36. Benjamin left at 15.01, flew more kilometres [226 ] but the speed from his Cirrus was 60 km./h. over 226 km. but he used 3 hours and 45 minutes! Only 7 from 35 finished! Some flew over 4 hours. Longest task of these Nationals was 261 km. 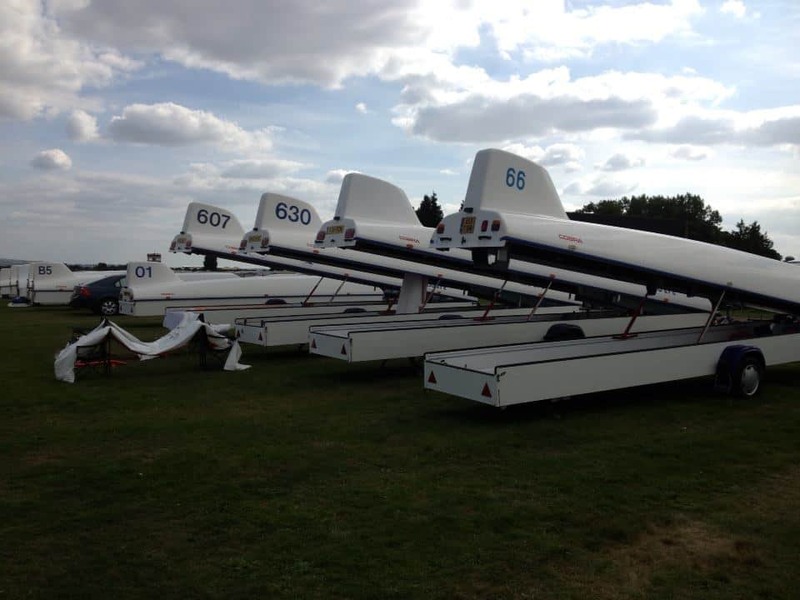 Parallel with these comps the standard and 15 m. Nationals have been flown with 28 participants. They had 6 days and also here well known names in the top; Frederic Hoyeau [Discus 2a] and Denis Geurin [ Ventus 2] .Also Richard Montigny did well in the Discus 1, gaining just 51 points less than Denis. Lisie Katy; The Polish Junior Nationals. Also in Poland a JWGC pilot tops the list; Mateusz Siodloczek, who was on spot 5 in the final scores then, just before the 2 Dutch pilots in standard class, is now on top again , with other competitors, but also with a very small difference in points as another Mateusz is on his heels; just 60 points difference! On the last day “the other Mateusz” won , but it was not enough to win the title; 14 points difference! Judyta and Jakub ,both also flying the JWGC followed on spot 5 and 4 in the final scores. In club class Wojchiek Majewski won the comps and title in the JUNIOR! On the last day he was 3d and except for 2 all pilots finished on this last day. Ben in Benalla this year in January. Zbigniew just did not make it home, he flew 415 from the 427.5 km. Lucasz was back on the top overall ,with Zbigniew as runner up. Day 7 FINALLY was an EXCELLENT last day; 528.2 km. won in an ASG 29 with speed 129 km./h. by Zdzisław Bednarczuk who finished overall on spot 8. 1. Lucasz Wojcik with 5775 in JS 1—-2. Zbigniew Nieradka with 5742 in Ventus 2CX —3. Janusz Centka with 5333 in ASG 29. 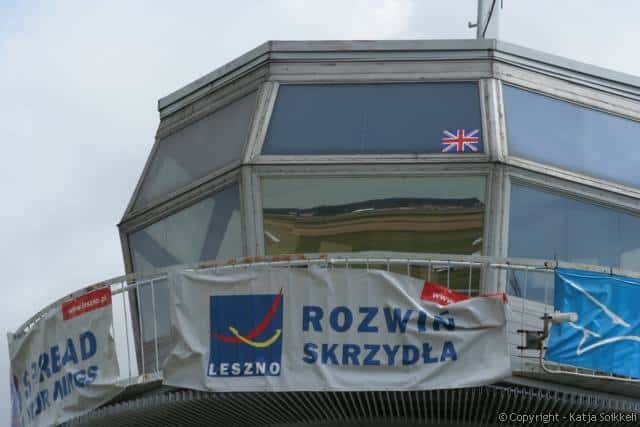 By the way , as mentioned before Lucasz won the 18 m. Leszno Cup as well , flown before between August 15 and 25,[7 days of soaring] finishing just 22 points before Zbigniew Nieradka . SORRY, don’t know anymore how I got this picture! 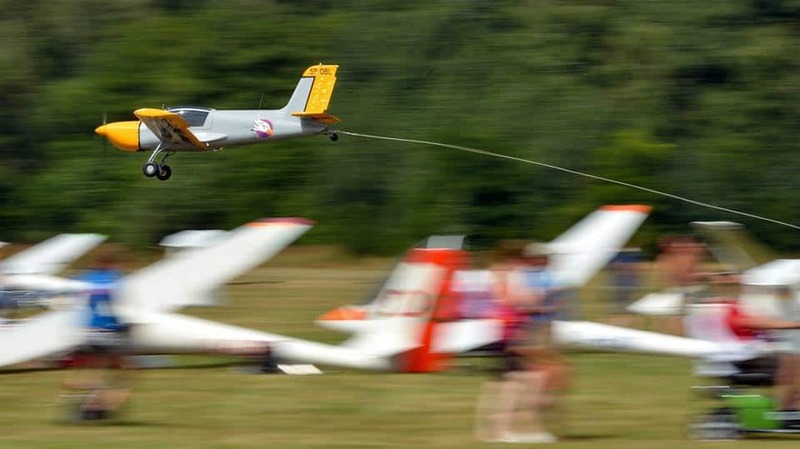 The up coming weekend the NATIONAL AIR GAMES , the VERY FIRST in Holland, will be held at Teuge, weather permitting. Looking forward to the story from Ronald Termaat who is going to fly the MS, yes the “‘old ” totally refinished Ventus a from Kees, at Teuge. AND,…he promised pictures ,….they can only be better than the ones I made with the wrong camera-setting from the MS at Keiheuvel. “ I was in Livno, flying every day, spending the afternoons with my family at the local lake until sunset. Then dining and grilling with friends at the airport and doing the same day in / day out. Milan Petković just finished his flying holiday. He flew 14/14 days consecutively. Because this is Livno. It has the weather from Namibia but it is not desert. The grass is green, the town is lively, wild horses are everywhere, the local lake is full of young people sunrise to sunset and the Dalmatian coast is one hour drive away. It is a place, where one’s wife and kids actually have something to do.Is it the best site in the world? Don’t get me wrong because I’m biased. But where else do you get Namibia style thermals, 4200m cloudbase, average speeds always above 120km/h (with a dry Ventus) and when the front passess the Bora (or SW) winds offer perfect ridge and wave soaring. From March to October (with ridge soaring year-round). Just to let you know this news as well. It’s from August 19, but I wanted to wait for permission to use it. On Wednesday August 28 2013. Great weekend at Keiheuvel Airport, even with some rain, it was just pleasure! No doubt about it. Thanks to all over there, for making us SO welcome! 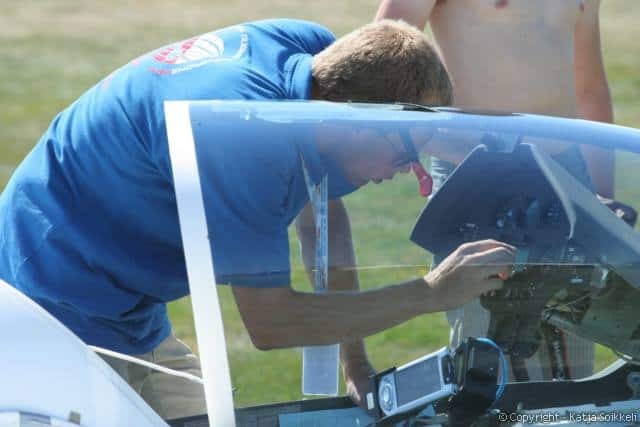 Back to the normal blog-style again and time to look at the Lüsse Nationals where German standard and club pilots are still busy with the comps. We did unfortunately not miss a lot, as the weather was not co-operating over the last days, but yesterday they flew again, after 3 non-flying days. Last day was Friday with a 246 km racing task for standard won by Achim Reuter just before Mario. 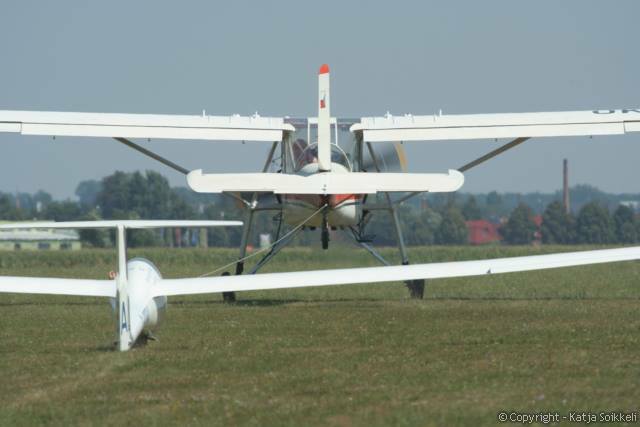 In club a 216 racing task won with a standard Libelle with 80 km./h. By the way 12 Libelles fly in this class, 4 in the top after 4 days! Remains a great beauty that Libelle! 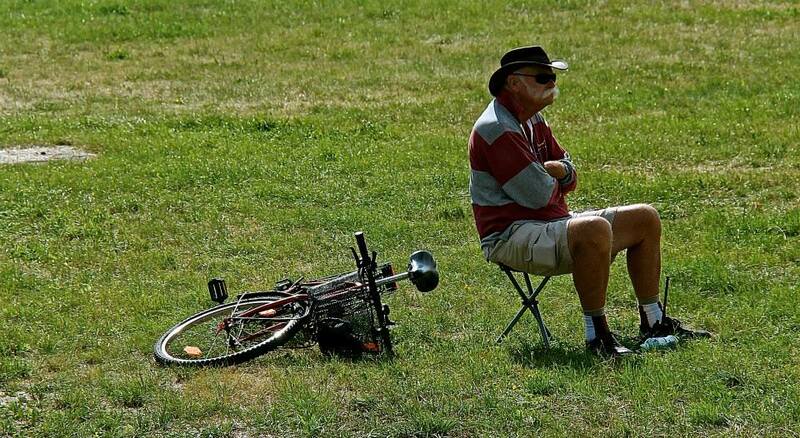 The club class pilots had 323 km and also here nobody finished at Lüsse, only those who returned to the field. Most flew between 100 and 130 km. and the first TP was the “new” airfield! 388 Points for the winner. 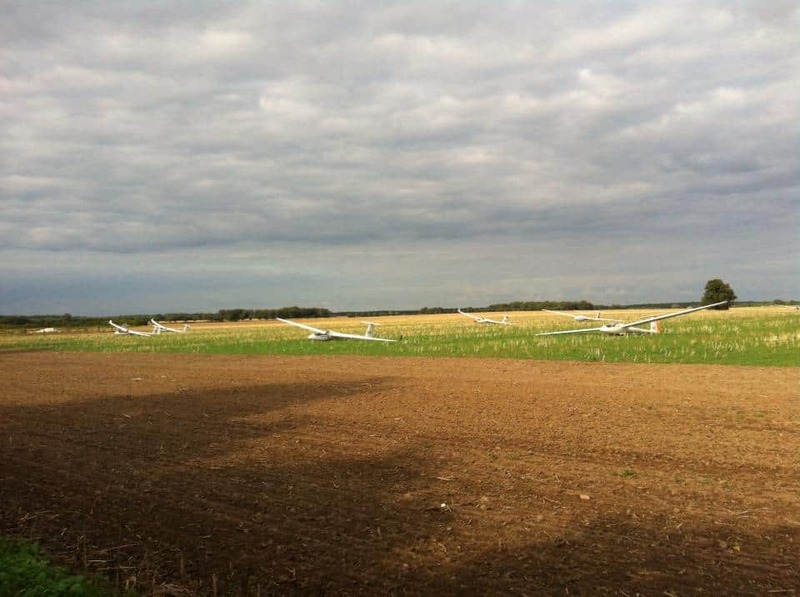 OUTLANDINGS, a lot in one “New” airfield as shared by Swaantje. 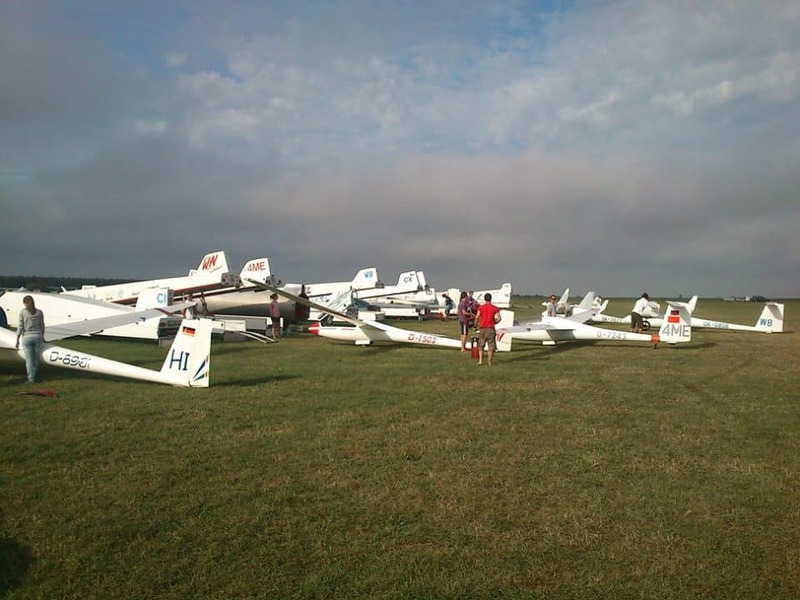 The UK 18 m. Nationals are flown in Bicester at the moment with 40 pilots. 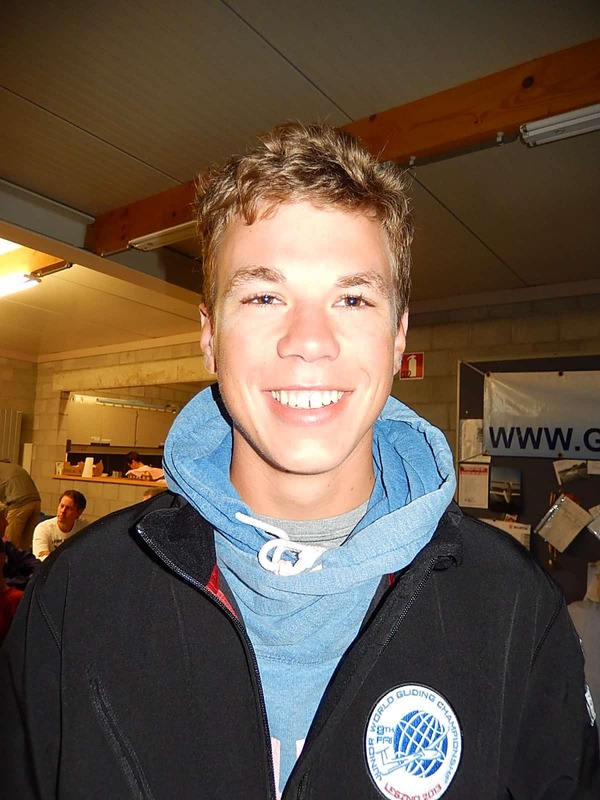 After 2 days Russell Cheetham is on top overall in the JS 1 , than 4 ASG 29 gliders and than Andy Davis in JS1. A lot more hopefully will happen till end of this week when the weather is good enough! 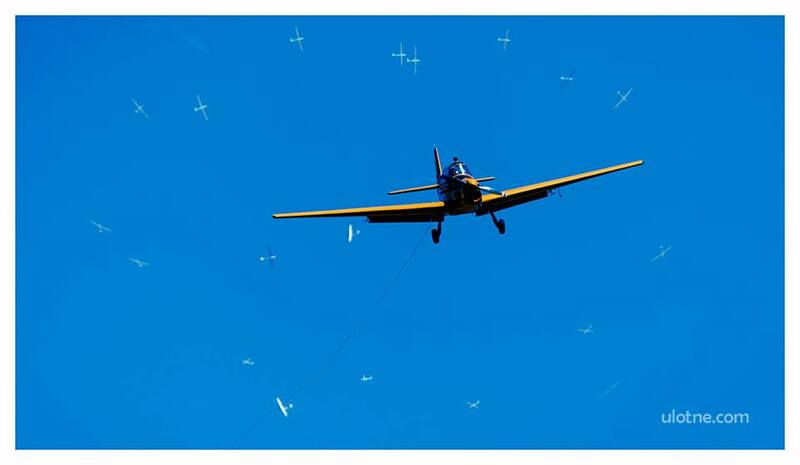 Yesterday they all went up in the air for 389 km and nearly all of them FINISHED! Ed Johnston won the 1000 km. before Russell and Andy and Steve Jones. My friends as Michael, Roy and Patrick were all in the middle bracket. All UK pilots UP in the air. Courtesy Alix Pentecost via FB. After 4 days of flying no surprise,…Zbigniew [Ventus 2cxa] is on spot 1 overall and good old Janusz Centka [ASG 29] on spot 2. Further on other Polish toppers as Lucasz Wojcik and Karol Staryszsak. Ben [ Ventus c] is on 15 from 33 ,…for sure NOT BAD!!!! Off to Amsterdam now. Over the next weeks I get some overseas guests and due to lack of time and to let my back and neck heal better from not sitting so much behind the laptop , I will publish soaring.eu temporarily ONLY on WEDNESDAY. On Sunday you can read my soaringcafe column as usual. www.soaringcafe.com This Sunday, an exclusive interview with the new JUNIOR WORLD CHAMPION in standard class Peter Millenaar AND his parents look back their way. Interesting to read! 2 Instead of 3 must be no problem for you and will be good for me. cheers Ritz on Wednesday August 21 2013. 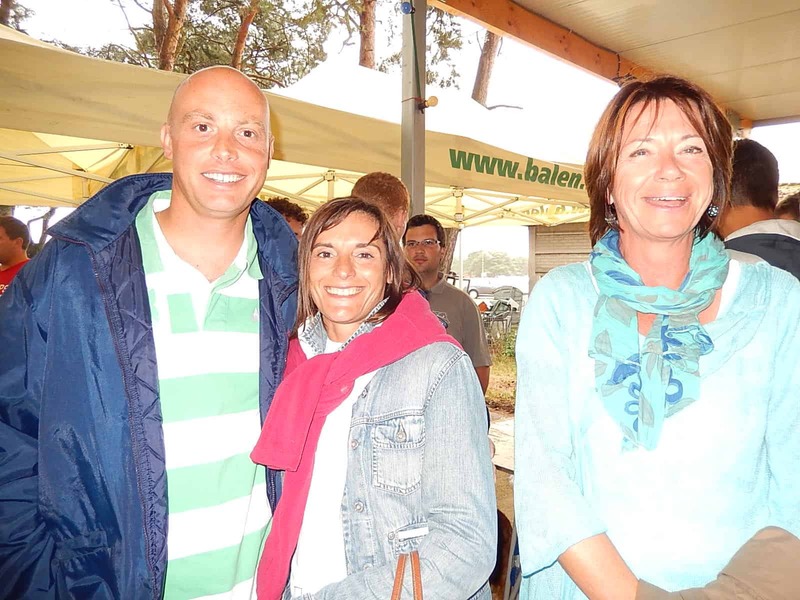 The 7th edition of the Keiheuvel Cup in words and pictures! The winner in Sport class; Bert jr. Schmelzer, who arrived in time from Zurich. The winner in Sport class with transponder; Jeroen Jennen. The winner in club class Sander Heeren. As you already knew, I left to visit the Royal Club of Keiheuvel last Friday. A 4 hour trip and looking outside of the train and car windows…. only SUPER weather; 28 dgr. ,greatlooking clouds , nearly no wind and sunny. Our caravan already placed on a good spot by the 85 year old nestor of the family Huybreckx, [thank you so much!!!] was already hooked on electricity , so we just could start to unpack, talking and kissing. Quickly we heard that the weather looked better than it was. Anyhow flying-in-pilots made it , the rest came by car and trailer. A lovely evening with great food in the KEI, the local restaurant from the parents from Jeroen [Jennen] and lot’s of friends. Till after mid night we were sitting outside, drinking and as usually old memories revived, a lot from the Sportavia time , as friends as Bert sr. ,Hilde, Danny, Dennis, Tim,Tijl, Emiel and more visited Tocumwal in the past. Dennis, Tim, Tijl and Bert jr and Danny. Sorry about the quality of the pictures. Still not too familiar with the new Nikon. I took all pictures on portrait!!!!!! Except those who are nice CLEAR!!! Saturday morning the briefing was at 10. We had rain in the night and early morning, but the forecast for later in the day, was pretty good. 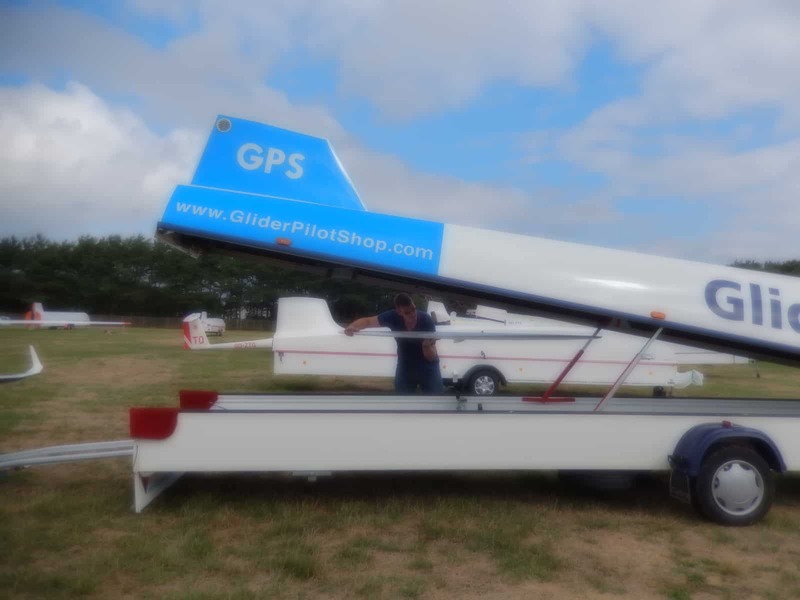 A new briefing, to see how good, was held by the organisers at 12 and not long after 1 PM the launches started by 4 tuggies for tasks between 101 km for club and nearly 190 km in a small window to the S and SE for the sport class and the sport-transponder-class. It turned out not a really good day, but certainly NOT a bad day with some strong “legs”; some struggled with the wind, some with the restricted areas. Unfortunately one of the reasons Keiheuvel has only a weekend competition is the terribly complicated airspace nowadays. We had the pleasure of really “spiffy ” finishes, first the brothers Schmelzer at around 4.30 PM, and later the JS1 and Ventus bt. in formation. We listened how p.e. Emile de Wachter who arrived in the night from Bailleau, where he still had flown his last day on Friday, started really late….. nearly an hour after the rest, left high at 1100 m. but too late, as his wife already carefully mentioned, cause some “milky-stuff” came in for a while, making conditions more difficult. Later however the weather improved and pilots finished till just before 6 PM. BUT,….We also heard that several pilots had to land out or returned to the field, as Emile did. Money prizes for the winners were donated by the Emsens family and the Albert Schmelzer Cup for the best junior was ready to be presented. Rene taking the stabilo out and father and son van Bremen, today for change in an ARCUS. I had a “lump in the throat” when I saw the MS and carefully investigated if it was the MS, in which Kees Musters won the WGC in Hobbs. It looked terrific and is owned, after a few different owners, one even in the UK, by Mark van Bremen, who did a lot of work on it, together with pilot-for-the-day Johan Lemmens. It also has been refinished , both fuselage and wings in Poland and looks like NEW. The MS in full glory, flown by Johan Lemmens who flew for the 30thiest time/year at Keiheuvel and Mark and Fred. 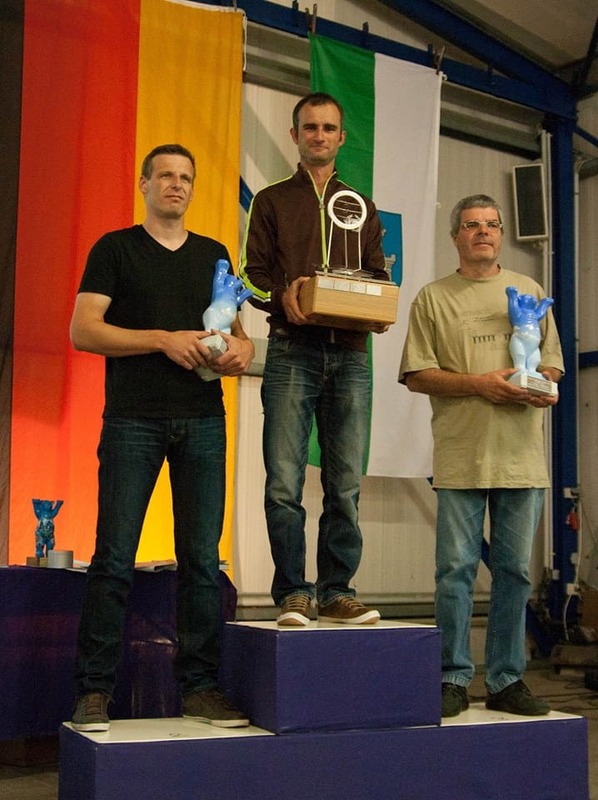 Top pilots enough at Keiheuvel ; as the NUMBER 1 in Mengen at the recent 18m and open class German Nationals, Yves Jeanmotte and his mate Jean Luc Colsson and their partners. 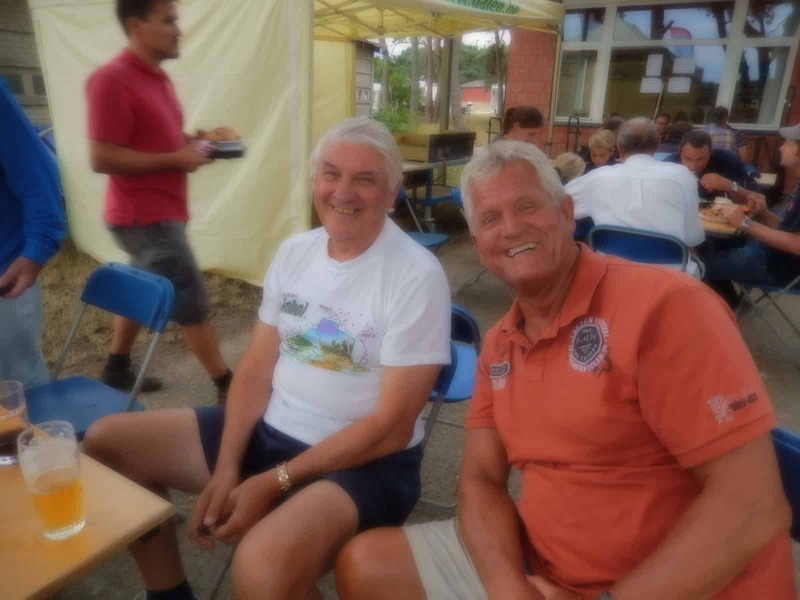 Ken Evens , who was coach in Leszno and father and son Marc [TC in Ostrow for the Belgium team] and Tim Huybreckx, soon to be father himself. That’s it. A lovely weekend is over. More tomorrow in soaringcafe. On Sunday evening August 18 2013. CIM finished , Lüsse continues and on my way to Keiheuvel! Restaurant to the left and caravan park to the right. Huge ” runway” in the middle. What a paradise Keiheuvel is!!!! And such lovely people. 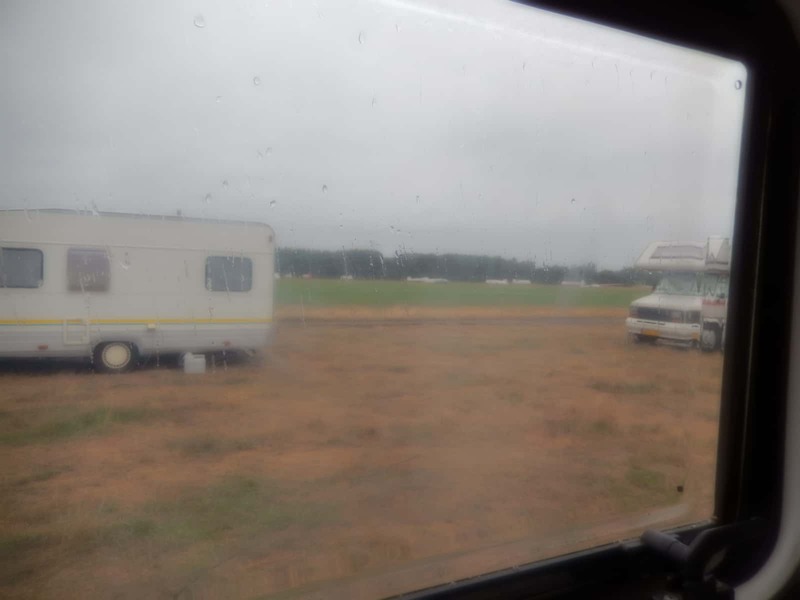 The airfield is in the middle of trees and white sand, the caravan park under the trees and a high quality restaurant, meeting -place for everybody, on side. It feels so at home, maybe because I was there already when I was [really] young. Looking forward to my visit! In Lüsse they had day 2 on Wednesday with a lot of re-launches at noon, but also finishers in the early evening. But not a lot . Only 18 in club class from 43 made it home and 32 from 42 in standard class. Tough day!!!! Still 1000 points for the winners in each class , for that reason big losses in points as well when you were on the wrong site. Good day for Alfred Paul from Holland; he is on spot 1 overall after 2 days in standard class. On Thursday [ today and day 3] early starts at 11.15 with standard class upfront. Great launching over there as I read that this class was in the air at 11.39!!! In ONE hour they got them all airborne ; great job! Startlines opened at 12.05 and 12.37 and the weather was just GOOD! So I presumed not so many outlandings. Pilots had 345 km. [st] and 301 km. to fly and went direction S. first and then to the Polish border for some well know after Leszno. In standard class all 41 returned home, best was Mario Kiessling , Super Mario, with 120 km./h .which was 11 km. faster then the runner up. Overall after 3 days some strong pilots; Mario, Alfred Paul and the 2 Levins. 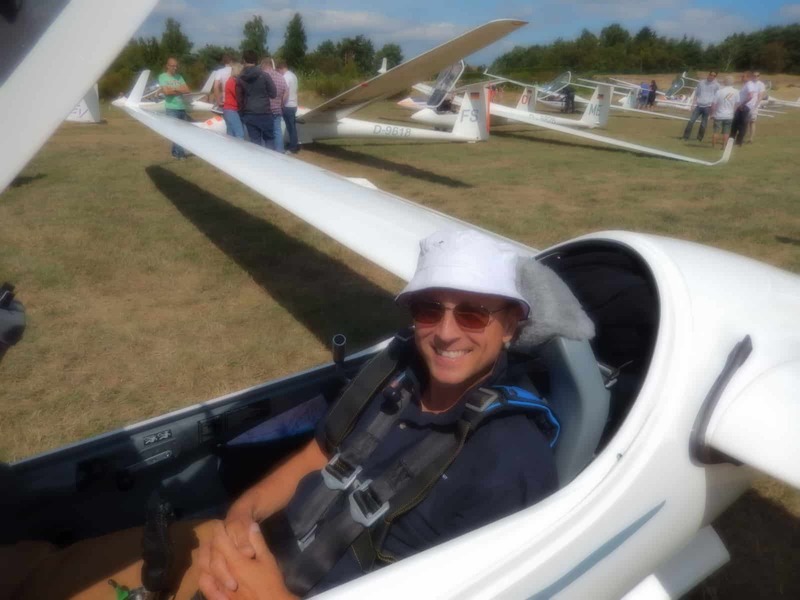 In club class it was Gerrit Feige who just won with 100.95 km./h flying together with his mate Lars Hagemann, also in St. Cirrus with 100.79 km./h. 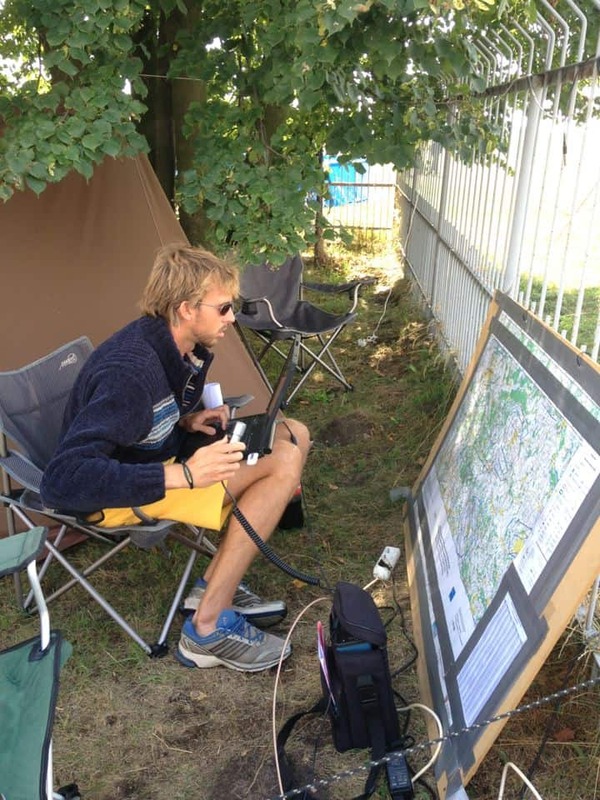 Gerrit and Lars were last on day 2 after an outlanding close by at 34 km , both gaining only 78 points. Today they got the most points, 995 and 992. Good on them!!! 8 Days to go so I will come back on Lüsse when I am back. Weather wise a fabulous day 8/9, as I read, with strong thermals and high speed . 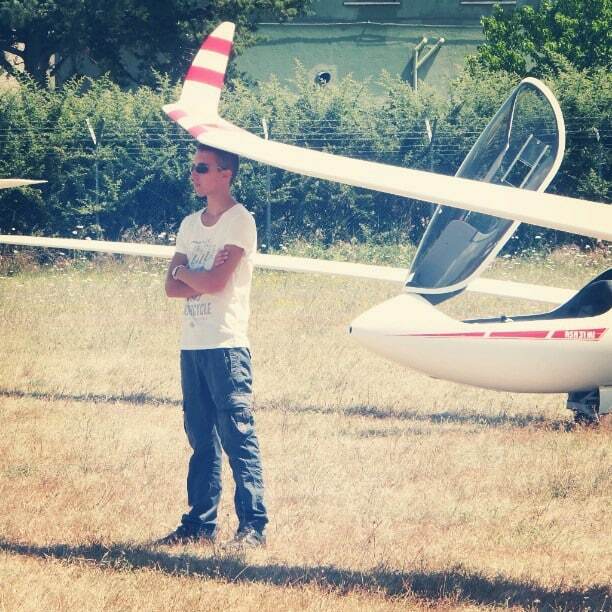 Lucio Bordin won day 9 in clubclass last Wednesday [305 km over 3 hour AAT, speed 95.4 km./h.] and that was his 4th victory. No secret he topped the overall scores, with more than 400 points over Austrian pilot, Rudolf Schneider and 600 on Andrea Tomasi. Vitorio Pinni won day 9 in standard class; 393 km. in a 3 hour AAT with 125 km./h. . I know him as a fast pilot when he flies the Rieti skies. Till now he was mostly in the top 10 with ONE outlanding when 8 other pilots finished, now he finally won a day. In 15 m. also day 9 and also a 3 hour AAT , won by Ricky with 385 km, in 3 hours on the dot; speed 128 km./h. Leigh was 2d, flew more km. but needed nearly 12 minutes more. Dane was 3d with 411 km but 21 minutes late. 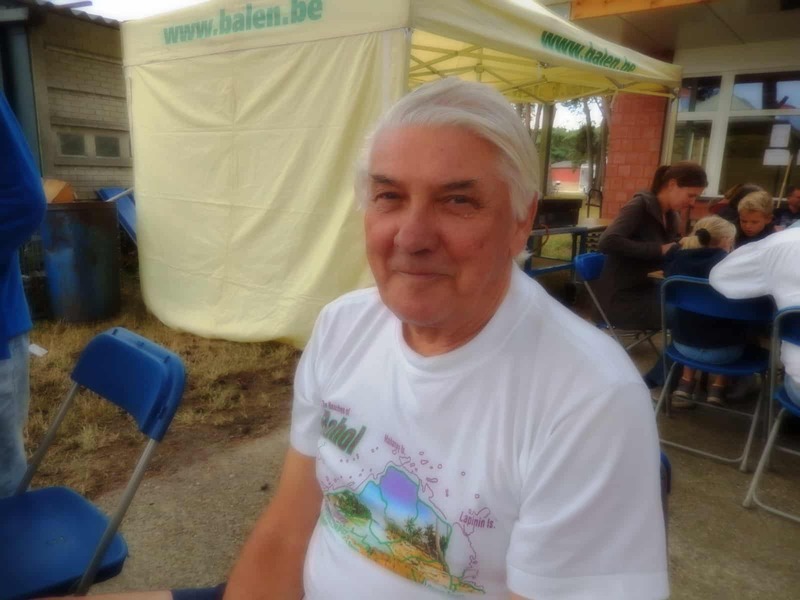 18 m. started on Wednesday for their 8th day and this time Peter [Austria] was the winner again with 412 km over a 3 hour AAT with a nice speed of 136 km./h. Louis [France] was runner up and UK pilot Afandi [ASG 29] was on the daily spot 3 again. 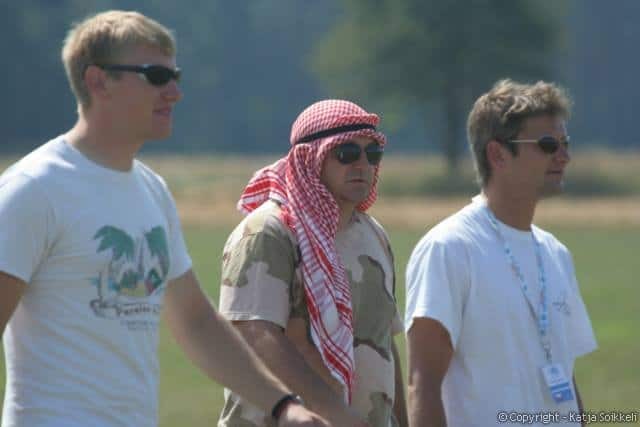 Good on him, as both Louis and Peter are WGC pilots , Afandi is not [yet] !! Louis is busy with a race back to the top! On day 4 he out landed and lost 600 points on Peter [ASW 27] . Slowly he climbed up again in his JS1 from spot 8 overall on day 4,… back to 3 overall on day 8, still with a difference in points from 138 on Afandi and 801 on Peter. In open /2 seater also day 8 and also a 3 hour AAT. Alvaro [ASH 31] won with 410 km. ;speed 133.2 km.!!! His 2d daily win whilst the Swiss Leutenegger/Buedke – team won 3 days. 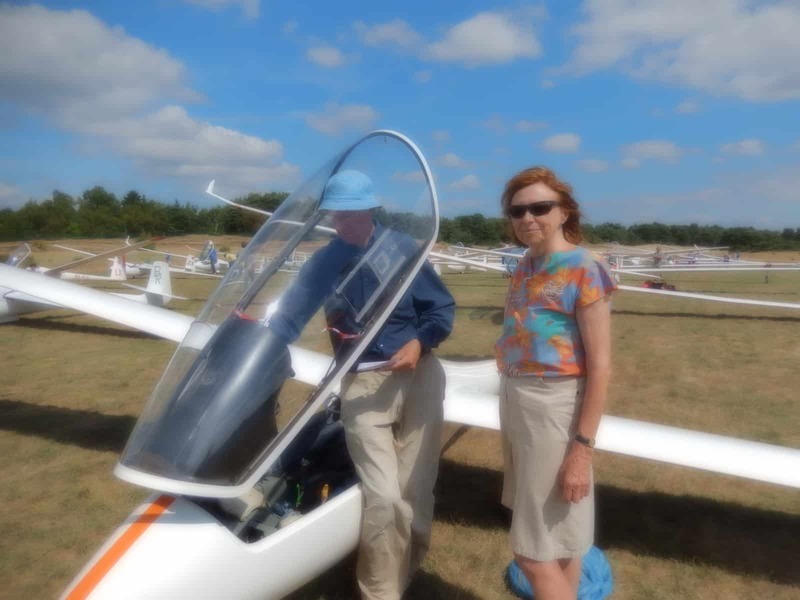 Last day today with a 2.30 AAT in all classes, a day with a lot of wind , forcing a few pilots to either land or virtual land , one even in the fence at the airport, as the gliders and storm arrived both on the same time, as Clara mentioned. 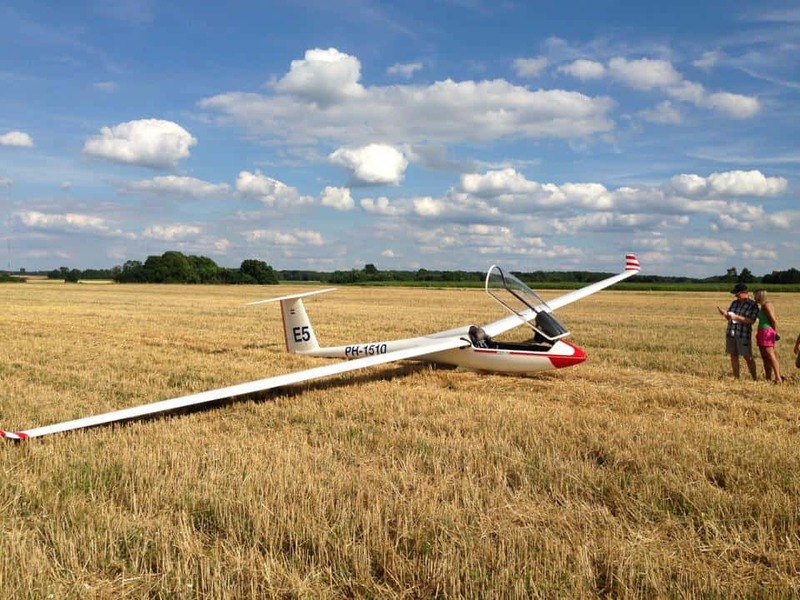 I saw a Finnish pilot land against the fence, a few years ago, only damage to the glider, pilot then was not hurt. In club class Andrea Tomasi won and as these scores are preliminary they can still change ,but Andrea would finish overall on spot 3. 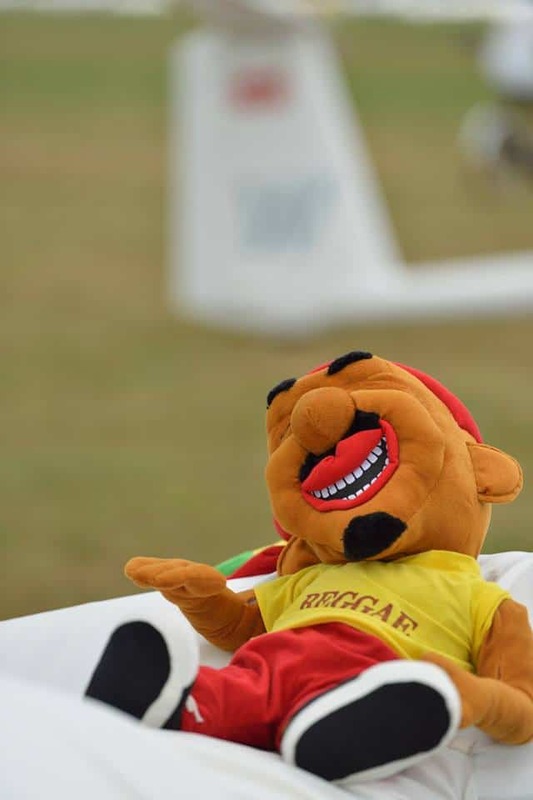 In Standard class Reinhard Haggenmuller was the best on day 10, John Coutts will win as he is about 500 points ahead of his country mate Ben Flewett. In 15 m. no big surprises, Dane, Leigh and Ricky. In 18 m.Louis won and came closer to Peter but it was not enough. BUT Afandi outlanded ,…..loosing about 350 points, so Louis will finish on spot 2 overall. Young Davide passed by as well, so he is on spot 3 and Afandi….. he unfortunately had to be satisfied with a 4th place. In open/2-seaters Aldo won the day and the Leutenegger team lost a few points by being on spot 8, but no worries they had points enough. Bad day for Alvaro who landed out ; only 205 points for him. For all other scores please look at www.soaringspot.com Thanks! 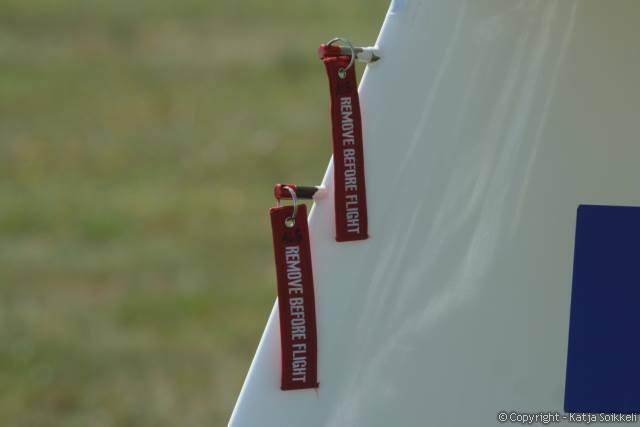 With a 3.30 AAT , a 313 km racing task and a 400 km. one , Bailleau had a good last but one day. With hopefully one day to go the highest scores in each of the 3 classes are at this stage for Holland, Germany and Belgium. Good flights from Bayreuth and Fuente today where another friend Michael was added to the ones already there! Have fun! on Thursday evening August 15 2013. 18m./ standard class Nationals in THE UK and CIM in ITALY. Bailleau ! BUT…..that does n’t say anything for 2015 in Narromine. So we can look ahead at a new great JWGC in Australia with experienced young pilots , but also with “fresh new blood”. Reading now what they all think whilst looking back is ; that it was a fabulous 3 weeks, for winners but also for those on the bottom of the scoring list, for crews TC’s , coaches and even for all interested readers. Lots of experience gained, lot’s of new friends made. That’s what it is all about! Boyd, as shared on FB. John was 553 points ahead of Ben when day 6 started!!! So he could allow himself a mistake. When he was not scored in the evening, I thought maybe he outlanded, but no he was 8th loosing just over 100 points on the number 1 and he easily could afford that. In 15 m. also New Zealand on top in , what New Zealands well known chief editor from Gliding International called “the mecca for soaring” Rieti. ; with Dane Dickinson as daily winner on Sunday and through that he ended on spot 2 overall after 6 days. [ 4935] Former WGC champion Leigh Wells from the UK was overall on spot 1 after 6 days,  with Ricardo Brigliadori on a 3d place  . Also 18 m. was interesting with after 5 days still Peter Hartmann on top overall with 3967 points winning 3 days. On Sunday [ day 5 for them] he won again; another 1000 points added this time for a 398 km racing task. In open/2 seater after 5 days still team Leutenegger on top  with Giorgio Galetto on spot 2  . 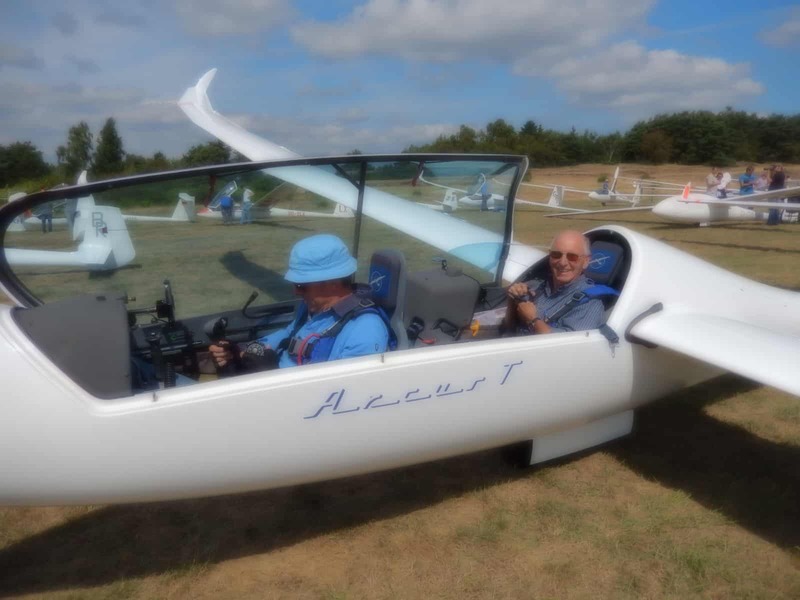 Both fly ARCUS T. First single seater is the Ventus 2CM with Thomas Gostner on 4. As shared on FB by Massimiliano Moricci. Standard class went for 309 km. winner Rene Schneebeli,with speed 126.3 km./h. before the 2 NZ pilots. 15 m. for 320.8 km. winner Leigh Wells with 120 km./h. his 4th daily-win. 18 m. for 352 km. 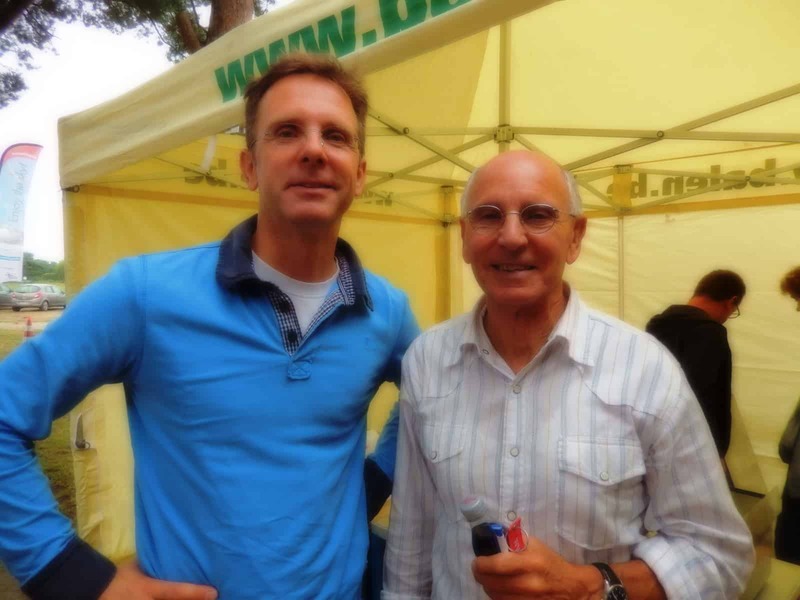 winner,…no….not Peter Hartmann [ he was 2d] but Louis Bouderlique this time with 132 km./h. and Afandi on 3. Open/2-seaters. also with 352 km. Winner here was Stefano Ghiorzo with his co pilot. Late starts around 14.40 and an off-day for Alvaro with an outlanding after 201 km. In the evening at 6 the organisers got an alarm from the PLB from one of the standard class pilots. 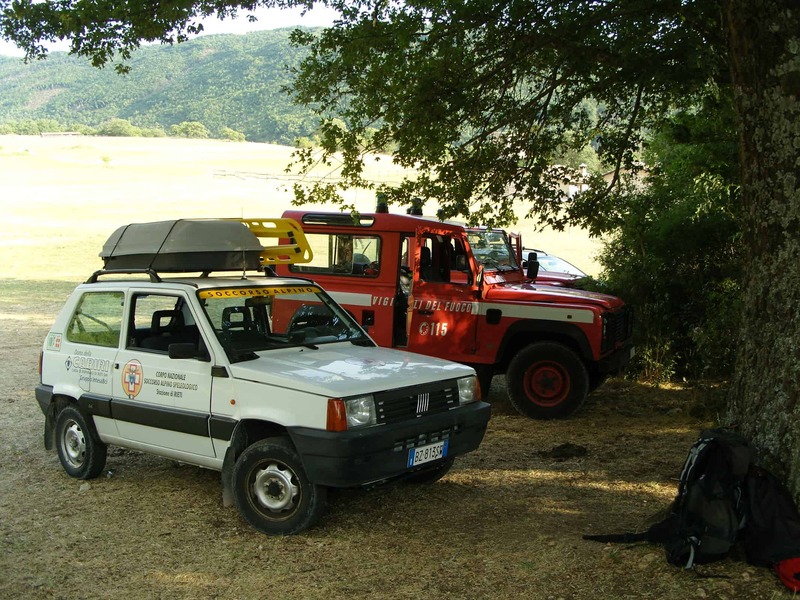 SAR and forest rangers, mountain rescue and police, all were active in a flash. I do remember, when I was there that they were searching for 2 days for an Austrian pilot a few years ago. Sadly enough he did not survive!Luckily this incident only finished in hospital for checks and minor injuries .Pffft…. SAR, as seen a couple of years ago. TERRIFIC GOOD people! 18 m. 396 km. Best 3; copy from day 6. Louis, Peter , Afandi. open/2 seaters 396 km. 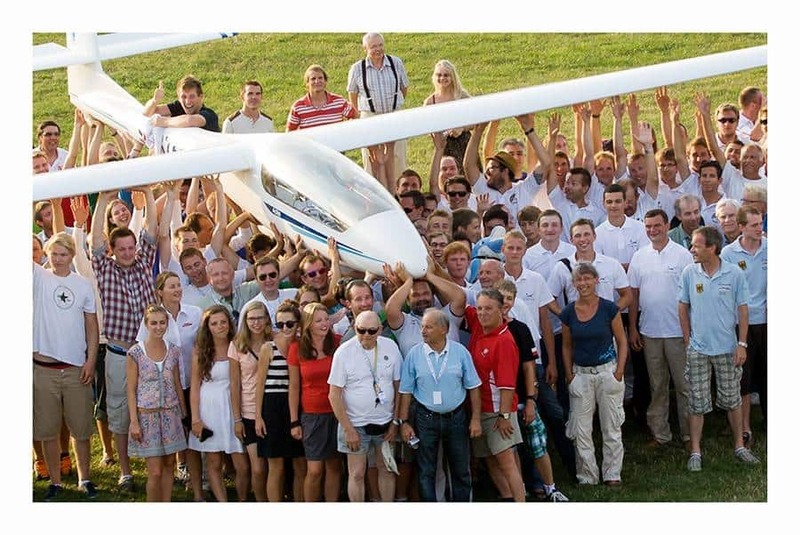 First 2 places 2 Swiss ARCUS teams, then Giorgio and another Swiss team, in EB 28 this time. 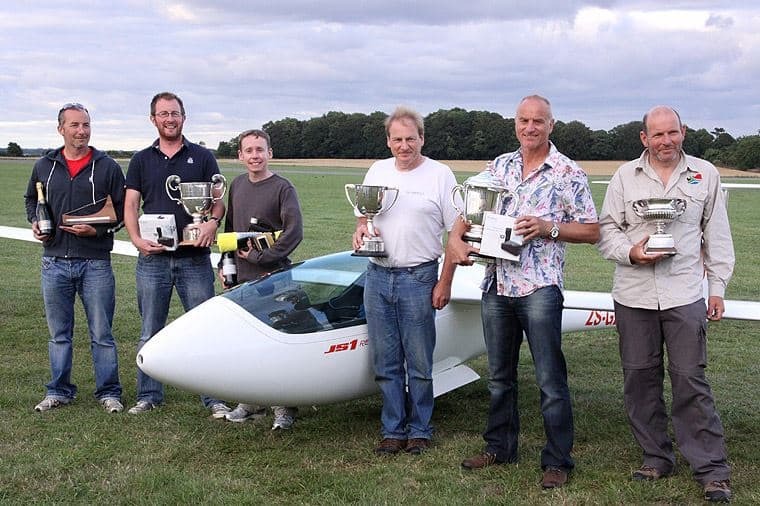 were flown in Aston Down from August 3 till August 11 2013 and organised by the Cotswold Gliding Club. Missed that one due to the JWGC, but look with pleasure back at the results as UK Nationals are ALWAYS interesting, with strong competitors. 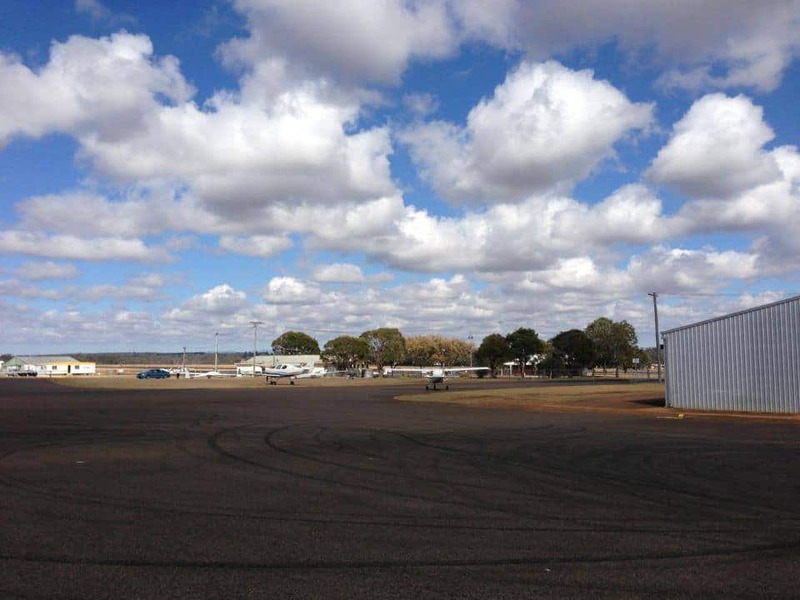 Open class had 12 participants with toppers as Pete Harvey , Andy Davis and Russell Cheetham , as well as Richard Kalin, who flew in the past a lot in Tocumwal. Who also flew in the past in Tocumwal is Standard class pilot Alison Mulder, who even learned there to fly cross country .She is one of 17 , with toppers as Howard Jones who flew in Uvalde and Ayala Truelove who finished on the silver spot during the last WWGC. And if I remember well Russell Francis , in this class, flew with us in the past too. As shared on FB by Sven Olivier. 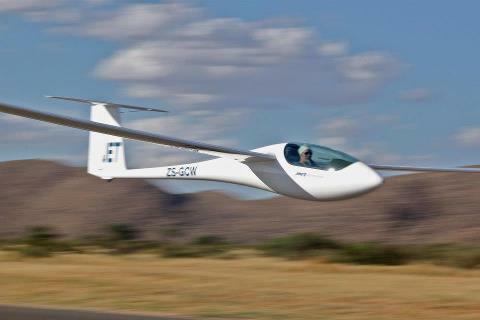 3 JS1 C /21 m. gliders in the top 3 after 6 days of flying in open class and 2 scrubbed days, when the last day started last Sunday. Andy Davis who won 2 days and was 2d on 3 other days . Russell Cheetham who won 2 days. Iain Evans with a one day-win on day 2. So they needed to secure their spot 1-2-3 ranking on that last day. AND they did!!!!! Andy WON the last day as well being 11 km./h faster than the daily- runner -up Russell and Pete was 3d but that was not enough to be on the podium . He ended on spot 6 overall, after loosing in his Nimbus 4 T, most points in the beginning and on the last but one day. In standard class 3 scrubbed days and in the top Howard Jones [Discus 2] , Richard Hood [LS8] and Paul Fritche [Ls 8] each winning a day and Howard even 3 !!! !BUT,… here something went wrong on that last day, as Howard finished on a 2d spot Richard won and instead of Paul it was David Bromley on 3!!! Interesting to analyse what happened on Sunday on the last day in standard class ????? First the time difference in start was BIG; ONE hour between the first starter at 13.58 and the last pilot departed at 14.57!!! But it was all about Howard, Richard and Paul and they started within 8 minutes from each other. The last starter did not make it home and landed after 174 km. Richard won the day and “got” 867 points whilst Howard finished on spot 14 , gaining only 570 points. That was enough for Richard to win. [4900 points] Howard was runner up  and David flew a bit better than Paul and beat him overall with 9 points. All winners in both classes. Courtesy Jonker Sailplanes , proud on their 3 winners in the JS 1C . So they should! This is a friendly “open” competition still with good/high level pilots . As usual ,a lot travel up from Holland! 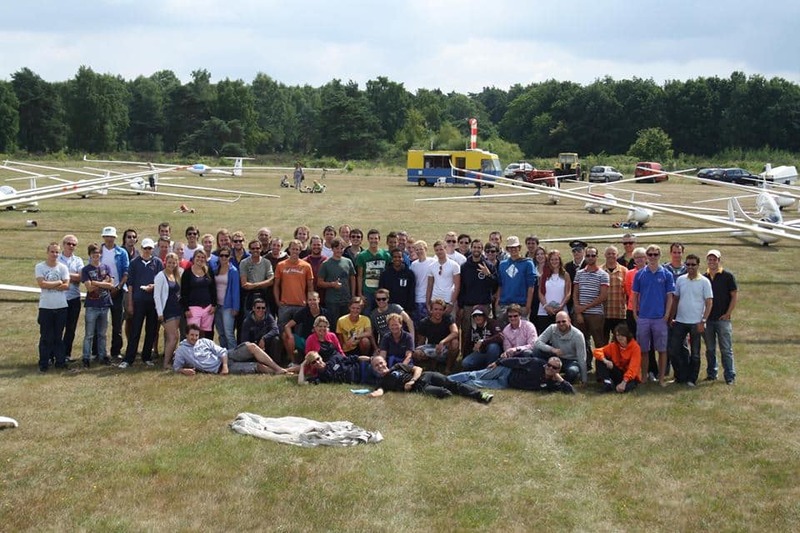 20 Pilots in the VITESSE [speed] class and 8 in the “amical” class and another 20 in the GRAND VOLS class [big flights]. They started on August 6 and continue till Sunday. They had 3 days of soaring and 3 scrubbed days, when I had time to “dive” into it. 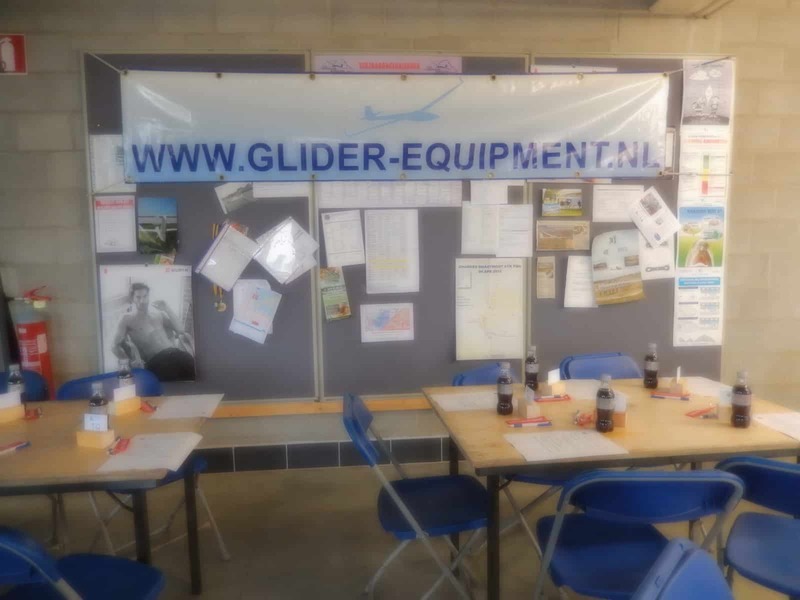 After those 3 days the 2 ARCUS gliders were on top; Dutch dealer for Schemmp-Hirth and open class pilot for Holland on WGC’s and EGC’s , Francois Jeremiasse and for Germany good old Sigi Baumgartl . 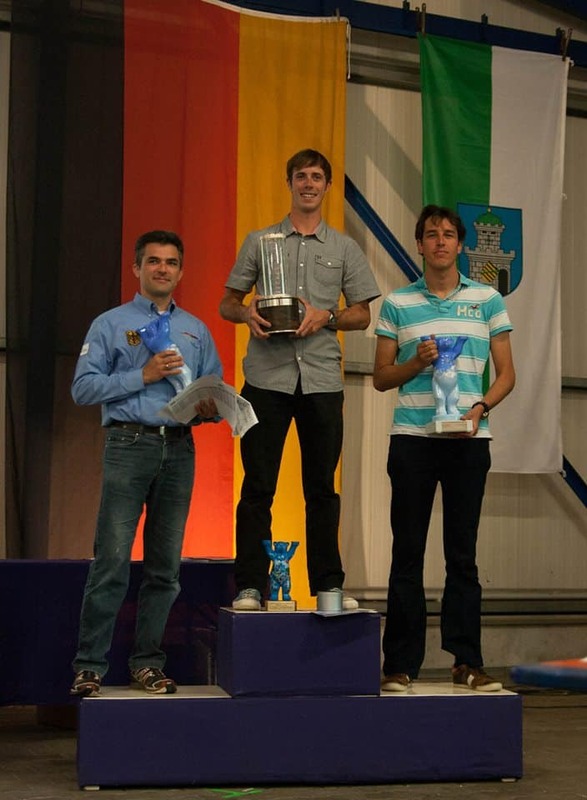 In the other class the Duo Discus from Eindhoven in Holland was in the lead , flown and shared by 3 pilots. The GRAND VOL class had on day 3 a 6 hour 30 AAT [ 475,0km/793,6km (632,0km)] which was won with 668 km. by French pilot Eric Garnier in a Ventus 2C 18 m. Dutch pilot Leon Mol flew 705 km. but in a Quintus M, so he finished that day on spot 5. On Monday small tasks [results at www.soaringspot.com] and yesterday bigger again with 389.6 km .in the speed class and 503 for those who liked the ” long flights” and nearly all pilots finished. Amical 300 km. ,Vitesse 5 hour AAT!!!! !, Grand Vols 464 km. The German Nationals in club- and- standard class started yesterday in Lüsse and continue till August 22. 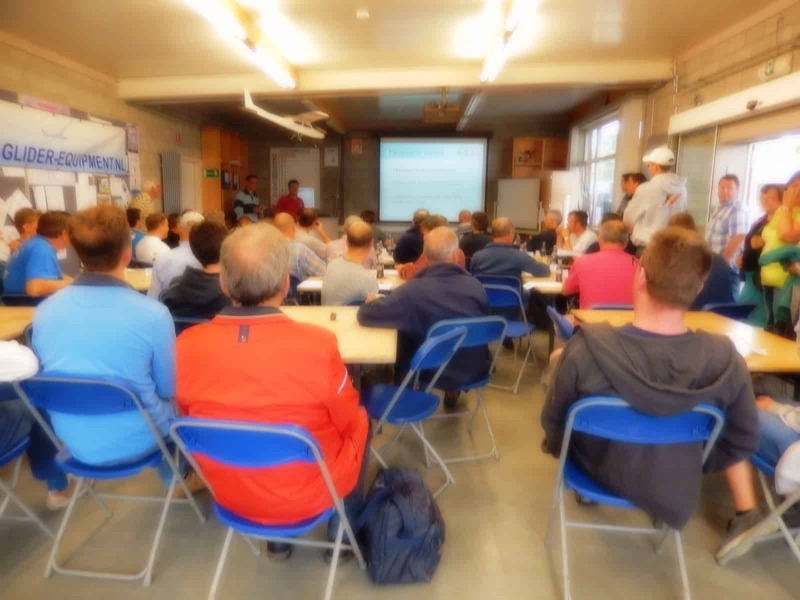 85 Participants in 2 classes including some international pilots started with a 2 hour and 2.30 AAT , some building up from cloud streets and local showers later in the day. Amongst the 42 pilots in standard class; Enrique and Filipe Levin, Mario Kiessling [first Junior World Champion in The Netherlands] Patrick Puskeiler [also a blogger ] and another blogger Benjamin Bachmeier who flew with his mate Fabian Peitz, who is competing as well , in Australia and last but not least Michael Buchtal. Also Dutch pilot Alfred Paul Alfers flies in his LS 8 a in this class. In club class ; Marco Barth just back from Leszno, Arndt Hovestadt, Swaantje Geyer and Sabrina Vogt, Wolli Beyer and Helge Liebertz and MANY more. Unfortunately a bad start of the comps for Marco Barth who only got 51 points for 30 km. of flying and then outlanded. The winner Lars Hagemann flew 170 km. and received 619 points, quite a difference, but it is still only day 1. Swaantje was on 10 and Sabrina landed out after 99 km. and was one of the 10 in total in this class. 850 points for daily winner Marko Zettier who flew in his Discus 2A, 248 km.Alfred Paul was on 6 [239 km] and Patrick on 7 [ 229 km] and 3 outlandings. Tasks for today with about the same weather, less rain, more cloud streets due to a tough wind :Standard 399.9 km and Club 308.5 km. Both A tasks at this stage. Did n’t look for a while at the OLC, missed that way the nice 1000 km. by Bostjan and Tanja Pristavec in the EB 28 from Livno [ Bosnie Herzegovina] with 130 km. /h. 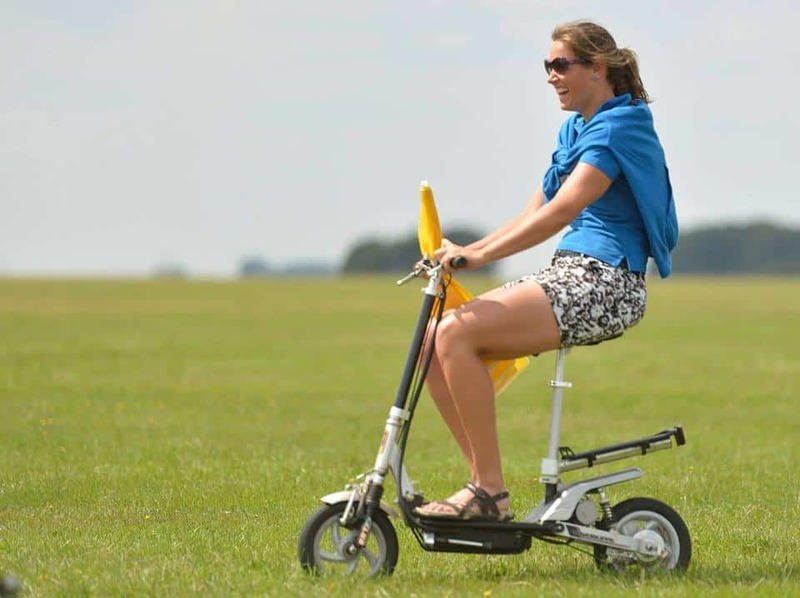 with one leg from 350 km., nearly an out and return, up to over 4216 m MSL. And also from Livno a 820 km. 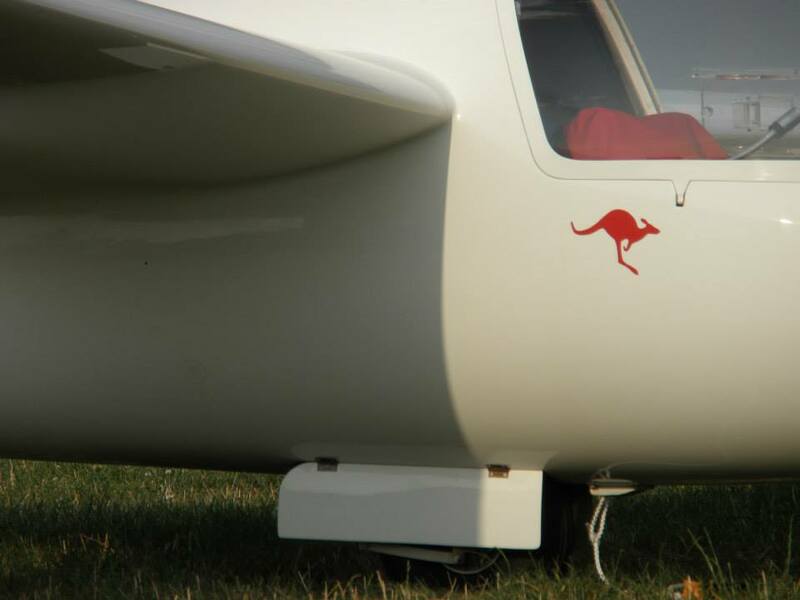 flight from Milan celebrating 30 years of gliding in Europe and Australia. Seems to be a great [wave-] soaring week there. Andrej Koller flew yesterday just over 800 km and mentioned “never ending convergence lines.” On August 8 he also flew 842 km. Most flights over 3000 MSL. The Livno area as shared by Uros Krasovic by mobile. Last Sunday I was more than pleased to see Hans Wiesenthal flying a 1000 again this time from Fuentemilanos. From 17 pilots flying that day he was the only 1000 km pilot. Old friends enough over there as Pepe flew 960 km. that day and Reinhard 819. Fuente still had good flights yesterday over 800 in the Ventus 2CM. AND,… 908 km. from Parowan in the USA in an ASH 26 E is not bad either! Sorry that I missed a few items due to spending a lot of time on the JWGC. I still love comps and it has my” heart and soul” ! When you missed the normal soaring-eu-stuff sorry about that. Will make it up again! To finish; Last Monday we were all sad and even a bit in shock in Holland , as in the morning Prince Friso died. He was only 44 years old . In February 2012 he was covered by snow due to an avalanche while skiing outside the set track, in Lech in Austria. We hoped, but in fact knew, he would not survive this accident. After complications he died , in a way still unexpectedly, in the Royal Palace in The Hague on Monday morning. He will be buried by his family and friends only on Friday on a small cemetery , only 5 minutes walking from where Princess Beatrix end of this year is going to live and where Friso spend his young years! As shared by the Telegraaf on internet. Cheers Ritz…. 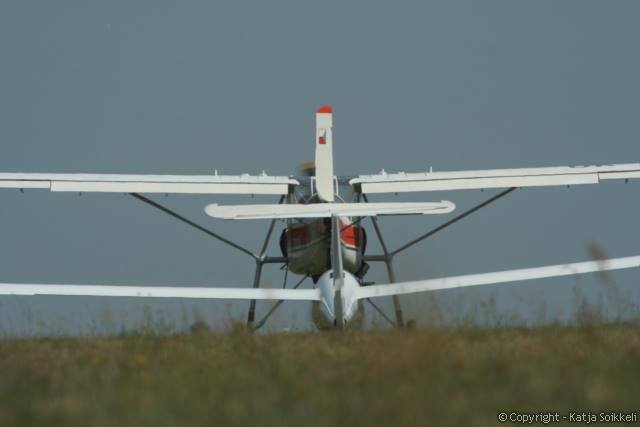 off to the 2 day -competition at Keiheuvel Airport in Belgium for the weekend. So the blog will be late [ don’t take the laptop] on Sunday or Monday morning, just to let you know! Weathergods were not “helping” the juniors! Last day makes us forget the bad weather-days! STUDIO LTV Jacek Lewiński idea!!! As shared by MANY on FB. Whataday it was on Wednesday ,….so marginal with the expectation it would NOT be a competition day ,…..and then it was!!! Great flying from the juniors. Thoughts of a young pilot, I am pleased to share and yes it is difficult also for older pilots; trying to win the title, as for some only ONE spot counts the NUMBER 1 or being happy with a good well fought runner up place or 2-3 or…! It’s all very subjective. Matthew by the way ended on a good 9th spot overall and is still young enough to participate in his own AUSTRALIA on the next JWGC in Narromine! 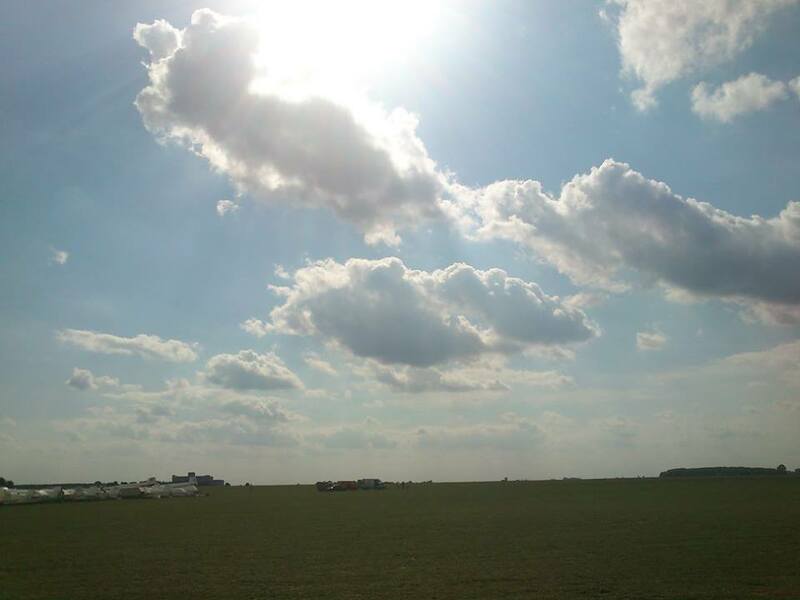 Skies looked good on the last day as shared by the JWGC site. SATURDAY FINAL DAY OF JWGC!!!!! A Dutch and French WORLD CHAMPION!!! It was a cold morning but there was still WARM hope for a day-of-flying by the organisers!No doubt about the fact that they were more enthusiastic/optimistic about the window to fly in than the pilots and TC’s. They expected cu’s, cloud streets and lift up to 2m./s. Standard class got the B task with 298.1 km instead of A 351 km.!! !Then the C and in the end the D TASK ;245 km. Clubbies went for a 3 hour AAT and then 2.30!!!! And indeed they went up eager to go and even with 3 m. average lift at places! Good call from the organisers! Standard class ready to go for their last task D.
As shared by Aussie team. It was a “hell of a day” looking at the trackers you were in hope and in hell seeing some low, some high …but slow. Knowing that the differences between the toppers was not too big EVERYTHING could happen. And it did!! In Club class the French “carried out a coup”. 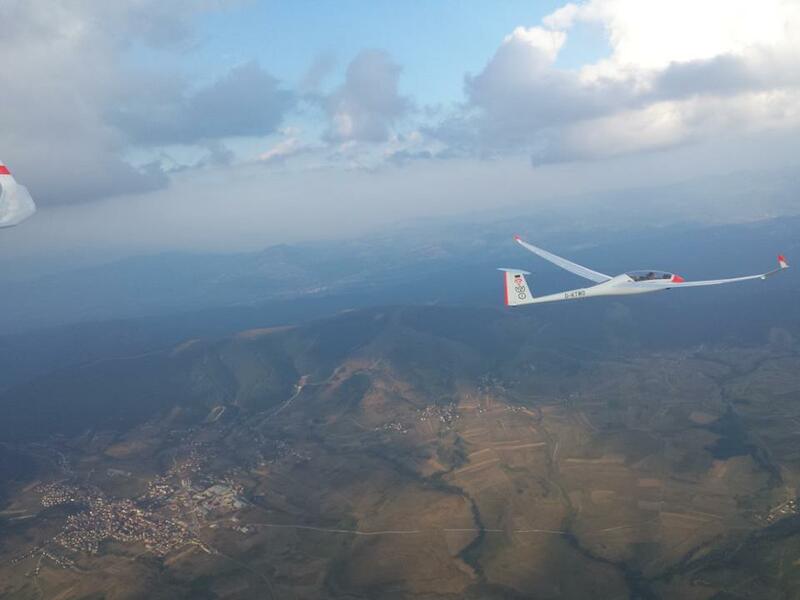 Being on spot 3 and 5 overall on the last but one day, Valentin and Benjamin started pretty early and flew both 236 km. in time 2.55. Some other pilots nearly flew for 4 hours!! !And quite a few even outlanded! Valentin jumped from 3 to ONE and Benjamin from 5 to 2. Great coup! Swiss pilot Maxime Petitpierre unfortunately dropped from 1 to 3 but still is on the podium today! The 2 French and Swiss on the podium and also 2 Dutch pilots on a good 6 and 7. 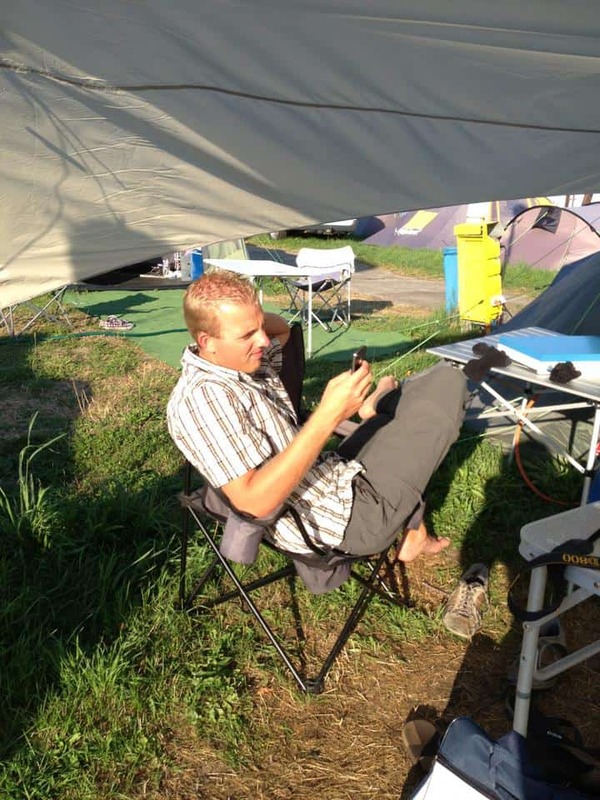 In standard class Peter Millenaar had to defend his first place he was “sitting on” for 3 non flying days. He flew in his own way with help from his Dutch team mates who kept an eye on the Czech pilots who were ready for their coup to take over spot 1 and 2. It ONLY JUST did not happen. Peter started early the Czechs later and had a better day , but,..Peter won just with a few points, 27, thanks to the 7 outlandings, 2 from his Dutch mates, providing less speed points. The story is even, that the 2 Dutch pilots sacrificed themselves by landing out, which would be great team spirit, but I am sure Peter could have done it by himself! He is just a GOOD pilot. When you “beat” Sebastian Kawa during the EGC on 4 days you are pretty good, is n’t it? Petr and Radek did their VERY best and finished on a well deserved spot 2 and 3. In the end we had 2 new CHAMPIONS!!!!!!! Valentin Grit from France in the Hornet and Peter Millenaar from Holland in the Discus 2 A, each with their own “coup”. Well done guys congratulations!!!! By the way I was impressed with the Swiss team and a bit disappointed in the German team. 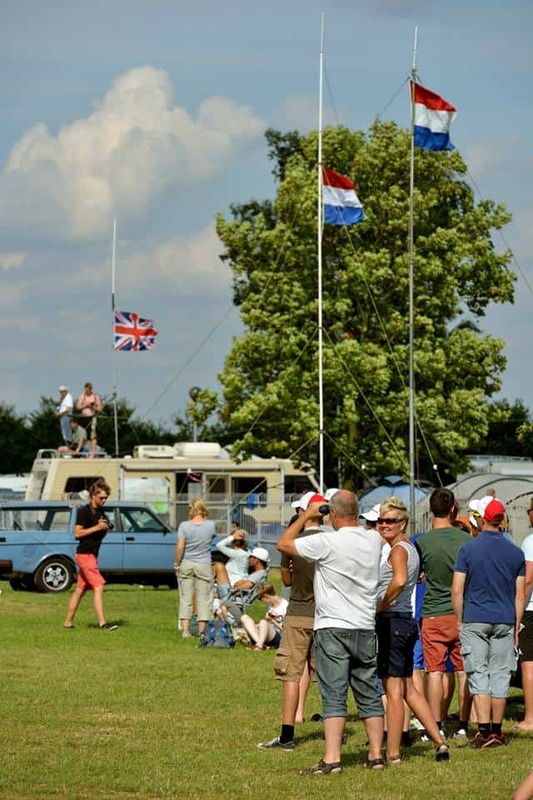 Dutch victory in pictures by Frouwke Kuijpers and Rob Millenaar. Hope to “find” some French pictures as well. Coach and the JWGC WORLD CHAMPION from 2011 Tim, advising and counting to oversee the scores. Bubbles ready and speech from TC Gerd 3d to the left. 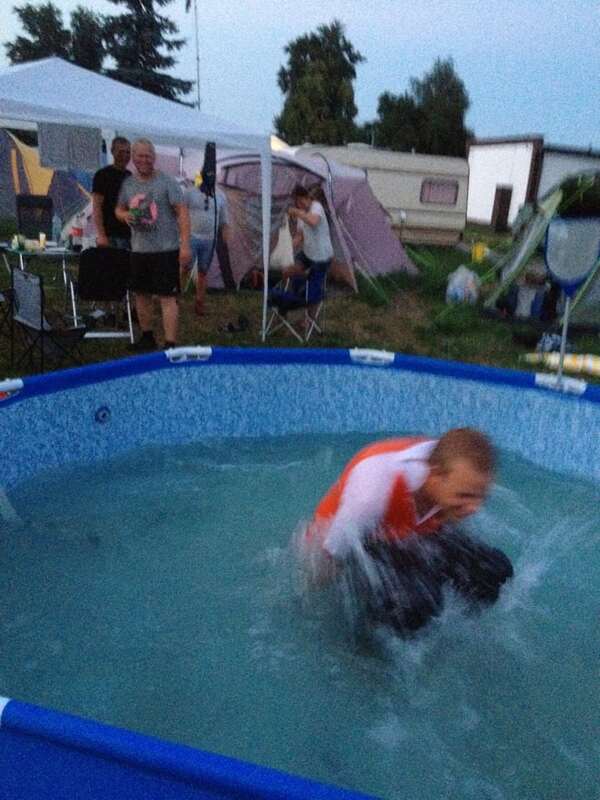 Dutch ritual; after winning you are thrown in the pool. And a happy chappy! More juniors as the Dutch Junior Nationals have been flown and finished yesterday. As you see enough “future”! 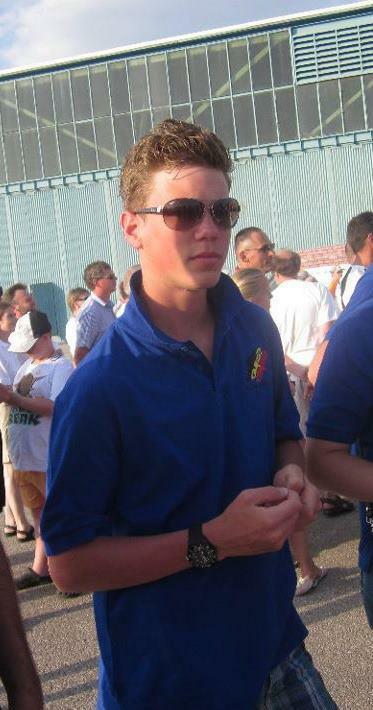 During the Dutch Junior Nationals experienced pilots fly with the young ones as scouts. 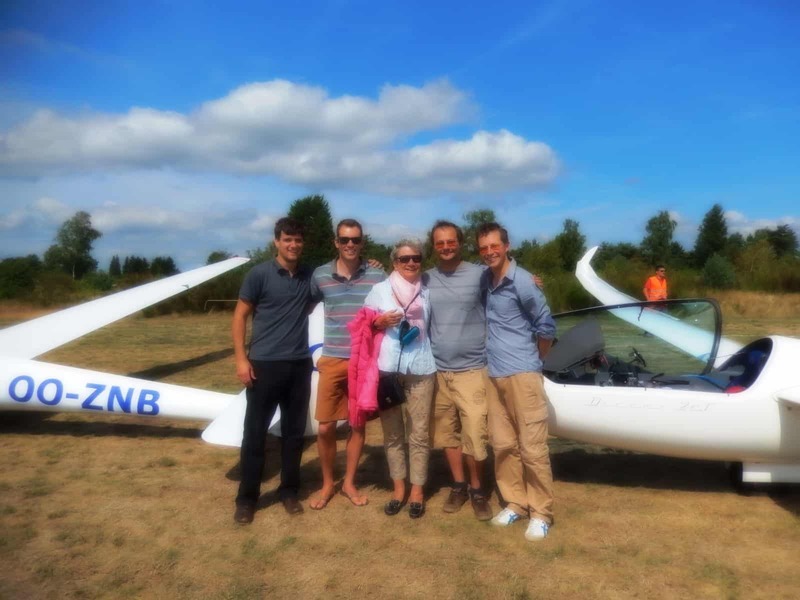 3 JS 1 gliders with 3 JS1 pilots Arne Böye- Muller from Denmark and Maurits Dortu and Ronald Termaat from Holland were the scouts on the last day. Good stuff and great to see they support the young ones!!!!! Once they were young as well! Also here the last day was a tough one. In standard class [2.30 AAT] only 3 from 12 finished and they ended in the top 3 overall. After 6 days [ only 2 days cancelled not too bad for Holland!!!] the winners in standard class were; Sander Terpstra ,[ 3634] Sjoerd van Empelen [ 3559] and Jens Bouma. 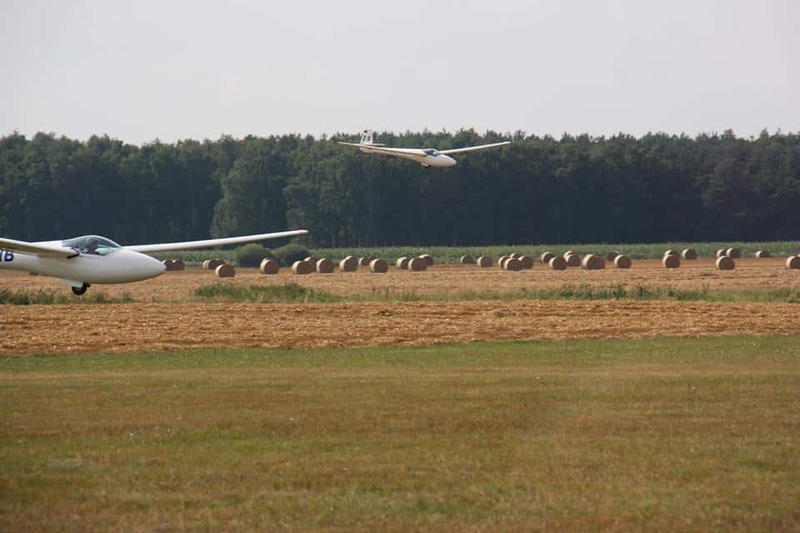 3 JS 1 gliders as “scouting-material”. And the CIM, the International Mediterranean Cup has added a few days. 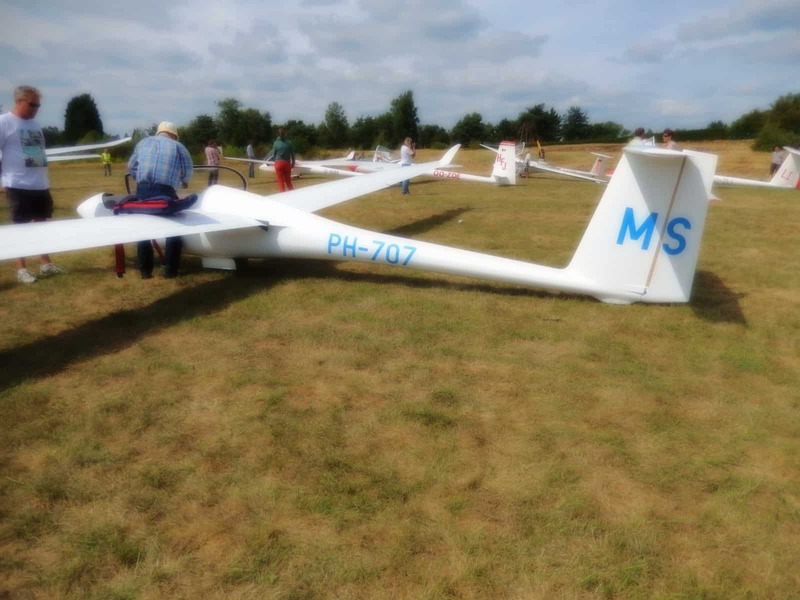 They are on 5 days in club, standard and 15 m and 4 in open and 18 m. where Peter Hartmann from Austria won 3 out of these 4 days , one day “beaten by UK pilot Afandi Darlington. More about the CIM in my next blog on Wednesday! Cheers Ritz at Sunday August 11. Sorry about the spaces between, something is wrong!!!!! Going to sort that out now! EXTRA EDITION; Wednesday “for clubbies only”! Wednesday; After some thunderstorms in the night it did not look too hopeful, but tasks were set . 2 hour AAT for the CLUBBIES! Task C: Paintball contest at 17PM. During briefing” the light was directed ” for a short while on Narromine the next stop for the JWGC in 2015. Then it was waiting, changing tasks and ,…starting but before the standard class could pass the start line,….. their day was cancelled, they had to come back and land again. Confusion, but the message was ; return to the field without delay. Clubbies went on for their small/reduced task; 1.30 AAT. A very tough day . In the end they ALL landed somewhere, luckily not TOO far away from Leszno! At least 13 should be over 100 km. and that did happen !!!! Even 21 got over it!!!! Well done!!!!!! Petra from Czech Rep. [ who has some Dutch fans and for good reasons] won the day with 130 km. and really deserved the 192 points. Hana also from Czech Rep. flew together with her and ended on spot 3 with 187 points. The girls had a good day! Unlucky day for Benjamin Vades from France who missed area 1 by 500 m. and dropped from 3 overall to 5. Luckily the points were not expensive ; 50 penalty points and a score for the day of 58 points. Good thing; all outlandings were OK and everybody was home in time for a good night rest. 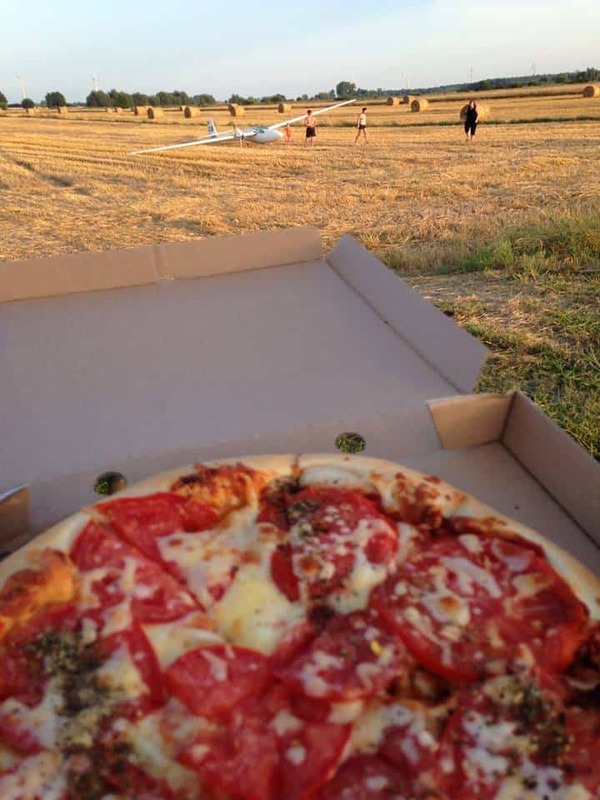 Some were spoiled as Belgium pilots Jeroen and Neil who got pizza delivered! 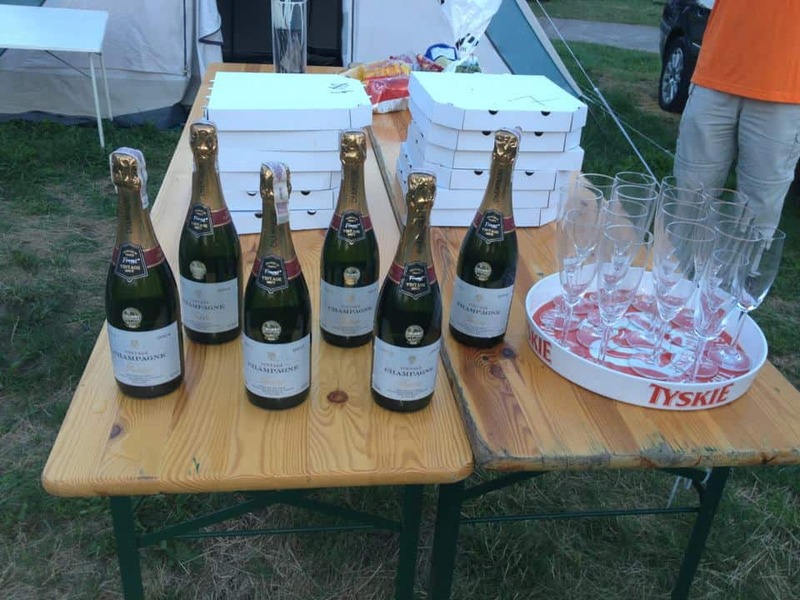 pizza dinner in the paddock!!!! On Tuesday 2 interesting stories about how it was in the air by the pilots themselves. Specially cause I know not a lot are on FB. Yesterday Iain had a much better day , though it did not give him a lot of points[ 185] he surely must be more satisfied with this flight being on spot 7 for the day. From the USA I got the message that there are “whispers” of a soaring segment on the AVIATORS . –“Psst, GLIDER and SOARING fans… we’re thinking of releasing a complete segment as a season 4 FREEview… and the one we’re considering is our long awaited Soaring segment! To make the blogs not TOO long, I try to publish a bit more during the last days of the LESZNO JWGC. So keep looking. 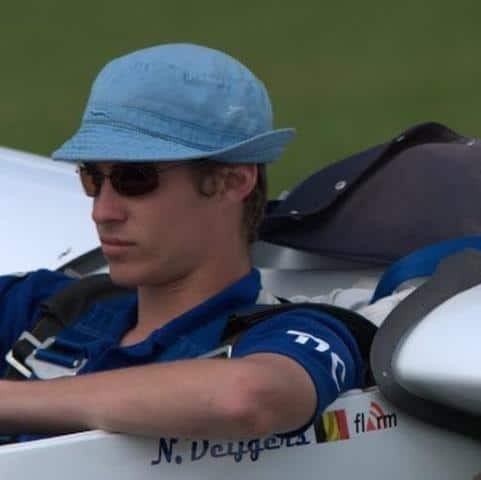 The Belgium pilots in club class are on “full steam” now and when Neil would have saved himself the 56 penalty points on day 3 , he would have had last Monday his second day-win instead of his first. As I said already earlier most teams have a very experienced TC and or coach with them.One way or another I think that the Belgium coach , Ken Evens, lovely and very experienced guy, has a very good influence on the soaring from the Belgium boys. Good on them!!!! Coach Ken briefing the Belgium team. 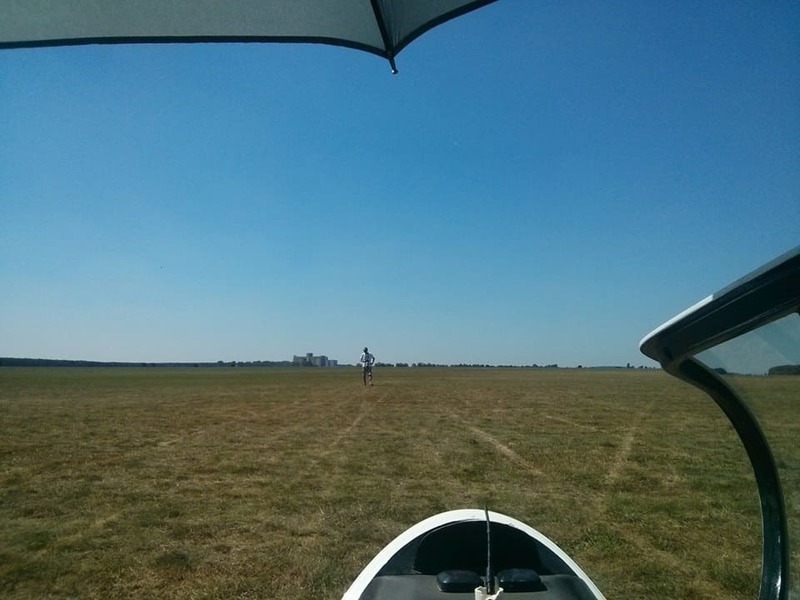 Club class had a 3 hour AAT and Neil [Deijgers] flew 294 km. in 3.01 Jeroen[tje Jennen] was 3d behind Marius from Lithuania [ 311 km. in 3 hours on the dot but not in a Libelle but LS 4] with 291 km. in 3.01 as well. Only one pilot “aux vaches”. 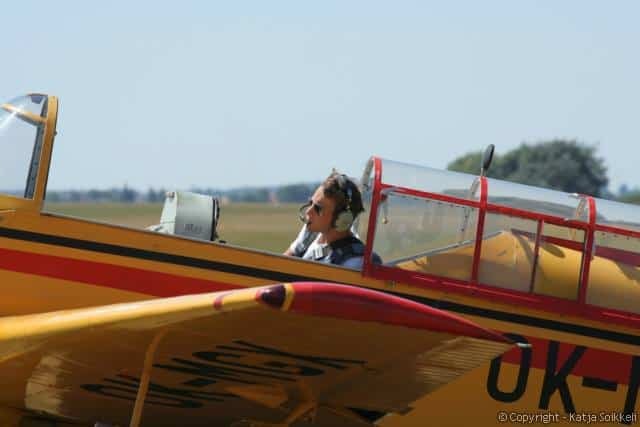 After 4 days the French pilot Benjamin Vades tops the overall list in the St. Cirrus , with Marco Barth from Germany on 2 and Maxime Petitpierre from Switzerland on 3 and the 2 Dutch boys both with the same amount of points on 4. 2 Libelles from Neil and Jeroen. Courtesy Belgium team via FB. Standard class had an A racing task from 292 km. which changed later , just prior to the start, in a BIGGER racing task over 324 km. Winner in this class , Peter Millenaar who started really late at 13.49, [ his coach later mentioned “tactical the correct decision”] whilst the first pilots already were over the start line at 12.56 [Alexander Späth who finished as number 3!] . Overall number 1 Petr lost 250 points by finishing as number 20. Overall number 1 after 5 days was now Peter again. Good on those low/flatland -country-boys from Belgium and Holland, both with a day-win! One of the other Dutch pilots was warmly welcomed too in the camp he flew 4 hours and 27 minutes, but FINISHED!!! He started as the last one at 13.58 .Sometimes taking a risk, pays out sometimes not. No worries a learning curve up! Chapeau! There were about 7 outlandings in this class. Yesterday [day 5/6] another scorcher-day with high temperatures and the expectation of difficult weather; blue and some cirrus, base at around 1600 m. and in the West were they expected some cu’s up to 2000 m. and max lift 2 m.
Club class has a racing task of 292.6km and a B task of 244.5km. and standard class a 3.45 AAT. [ 310.2km/579.2km] So it will be another interesting day! First launch was postponed as the sniffer an ASW 22 without water found lift , but not that easy; he , Janus Centka, had to go TWICE to do a proper job and found 1.7 at 950 m.
So tasks were changed into 240 km and 3 hour AAT. 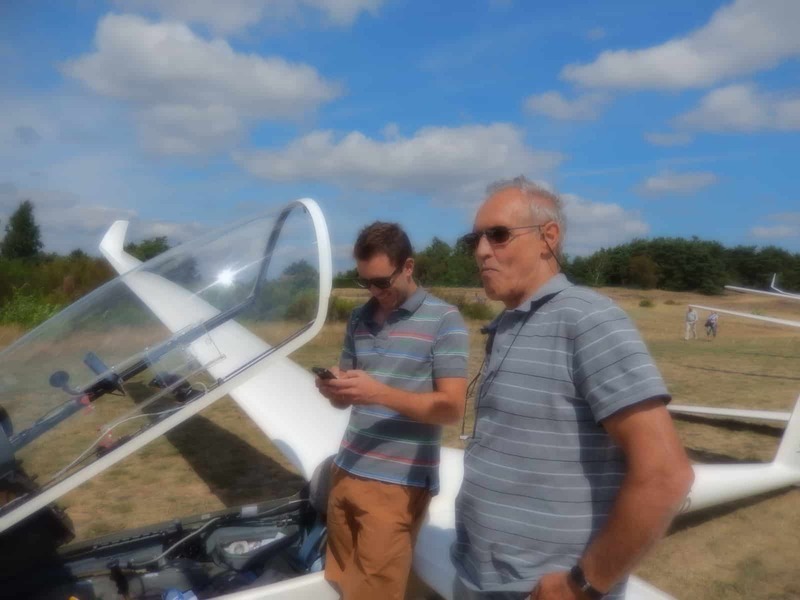 And pilots went from 12.30 onwards, whilst unexpectedly clouds popped up to the N.
Around 4 …..messages from outlandings , OUCH, as the 2 German toppers in standard class Enrique [EL]and Alexander [ALB] who both landed in the SAME field , about 54 km. from Leszno, both in the 3d sector, both early starters. Also one of the Dutch pilots Ronald [EJ] and Thomas [YB] from Belgium landed. In the end 43 in club class finished and 27 in standard, on a 1000 points-day, so expensive for those who missed out. Peter Millenaar flew the most kilometers but used a bit too much time in comparison with others; 3.29. 3.05 was as close as one came. 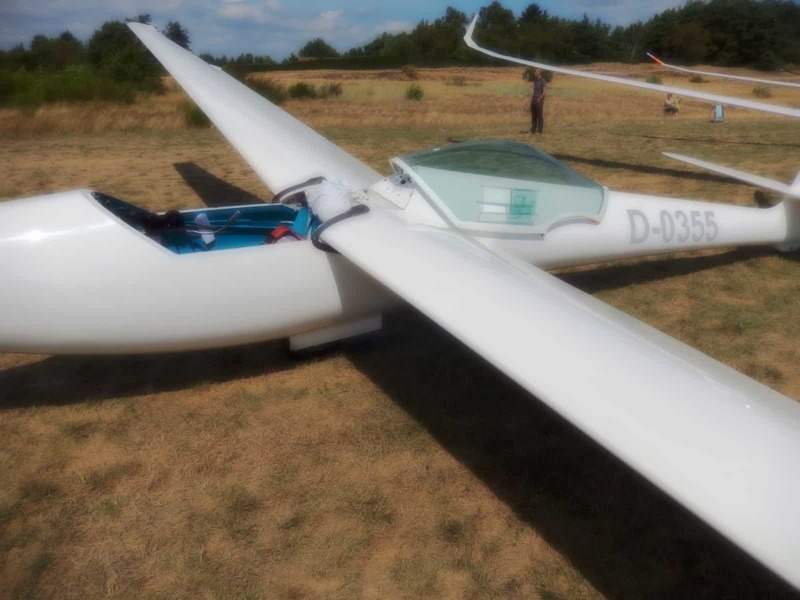 In club class it was Sweden, [ glider H4 with 944 points] Zwitserland [ GQ 934] and Germany  in the top 3 and for Aussie -girl Ailsa it was a good day , all electrics worked again and she could concentrate on soaring only, being 14th for the day. Good on her! Happy Ailsa on the rest day! 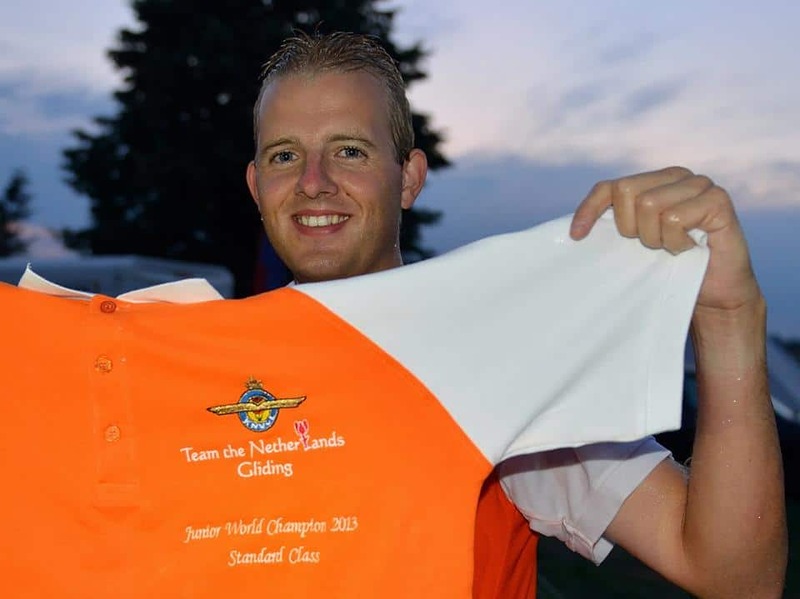 Dutch Junior Nationals; In Holland is quite a lot of talent in soaring as you can see already, when you follow the JWGC. 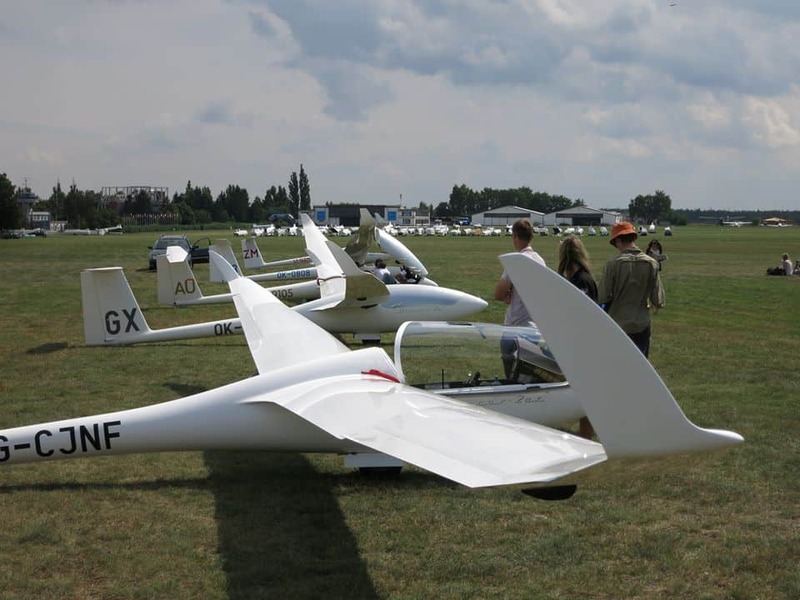 Young pilots who are ready to go for their first steps in competition soaring have started their NATIONAL JUNIOR competition in the S of Holland and fly from Venlo. Being good at Venlo means going up higher into the different comps. They started last Saturday flew already 4 days and today is day 5. Not bad! In standard class it is Friesland on the top with Sander Terpstra and Jens Bouma but yesterday a young member of the Gelderse settled in between overall ,after winning the 2 hour AAT-day, and in open class Rick Boerma from Hoogeveen who strongly leads and local pilot Wiek Schoenmakers who is on a 3d spot, with Odin van Oord from the ACVZ[Amsterdam] as runner up , all of course for the time being, with still 3 days to go. 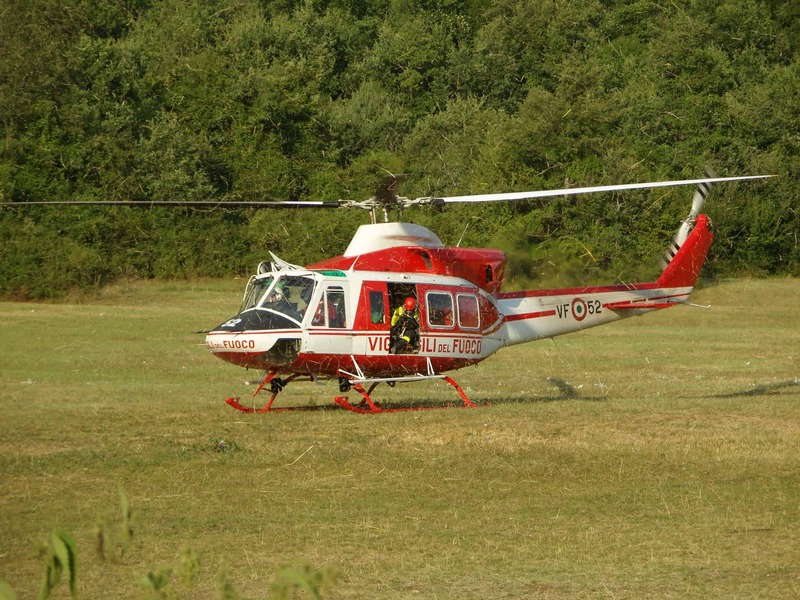 The CIM has started in Rieti in Italy on Monday with 76 pilots in 5 classes. Club with 6, standard with 16 and 15 m. with 12 including Ricardo Brigliadori and Dane Dickinson , who flew the Junior Worlds there in the eighties and former WGC champion Leigh Wells. Also 18 m. with 26 participants and Peter Hartmann from Austria and Louis Bouderlique were 1 and 2 on the first day. You surely remember their mid air collision in Uvalde. 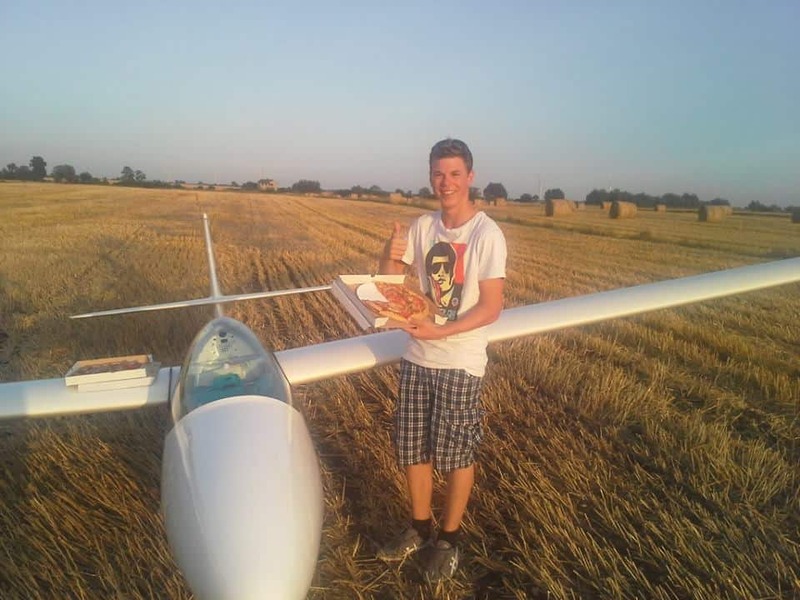 Also Davide Schiavotto flies in this class, he was/is one of the top junior pilots from Italy, but not so junior now anymore, still not old though. And not to forget former world champions Thomas Gostner and Stefano Ghiorzo , who was unlucky on day 1 landing out as the only one from all classes and loosing 800 points . You definitely need “luck” as well. Have great memories on the several comps I was invited to write there . I am sure they are going to miss Leonardo, who spend a lot of time in Rieti. Of course he was remembered in the opening briefing. A very mixed group of pilots from several countries even from Australia and New Zealand but also from other European countries . A lot from Austria. Yesterday they had tasks between 428 in the open class and 313 in club class. 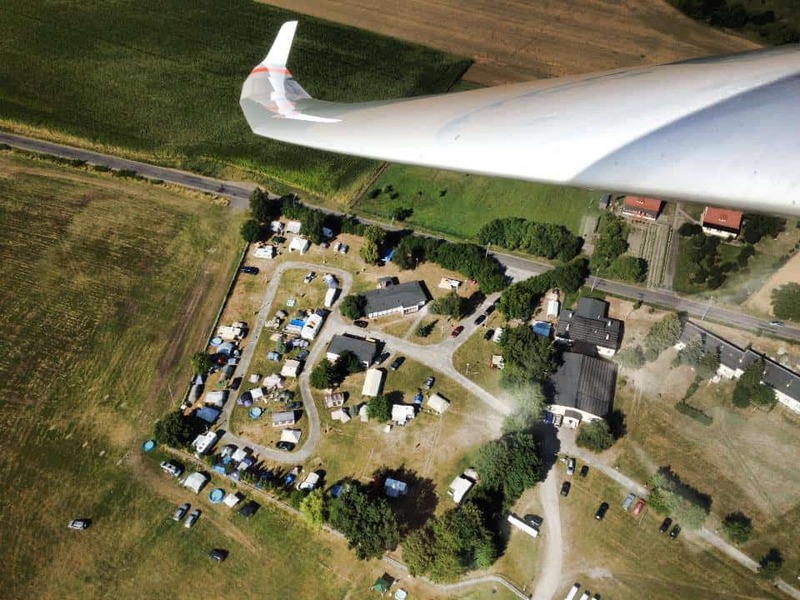 In open it was Switzerland again with the Leutenegger team flying with a speed of 114.5 km./h. Giorgio and team partner were runner up.3 Outlandings in this class. In 18 m. 2000 points for Peter Hartmann after 2 days! 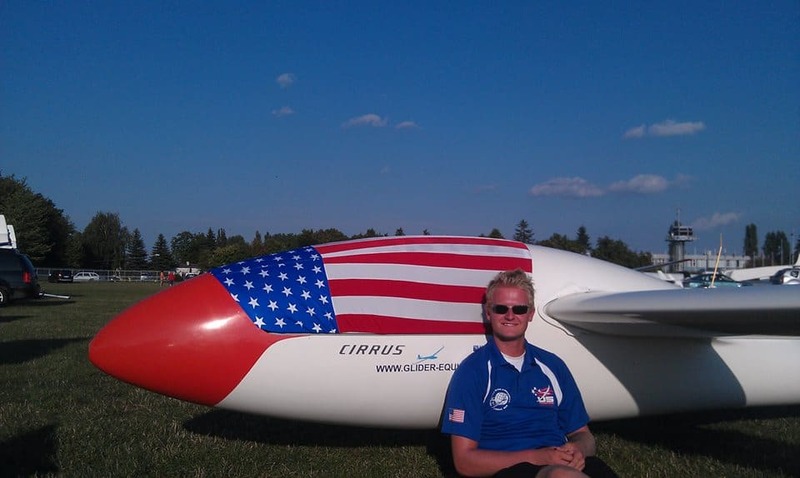 I noticed that during the USA hang glider Nationals in Big Spring in Texas still the same pilots are in the top as Atilla Bertok and Davis Staub. Jonny Durand had a bad second day with only 36.7 km. but was 4th on day 1. Enough news for this day see you on Sunday. On Wednesday August 7 2013. Lot’s of Fun and few Frustrations in Leszno! Life continued in Leszno with happy moments and frustrations as Aussie TC Beryl mentioned about Friday’s flying and logistics. Ailsa’s crew ,Kerry and Swaantje helped out the first week and Ben young top-Aussie-pilot arrived “late” from Australia to be her crew from now on. ” A frustrating day with an undercarriage problem for Matthew on take off. Power failure for Ailsa on the grid and poor Ben Loxton on the slowest trip to Poland finally arriving on a train that took 3 hours to cover 80klms. Here is what Ailsa said about the flight on Saturday. Luckily they all had a day off yesterday to get things in good order again. Not that they could sleep in as a loud thunderstorm woke them up , but atleast they could rest and there were was no pressure in the early morning. I noticed temperatures from in the low thirties so that’s pretty tiring. —“Yesterday was a ridiculously hot blue day. Temperatures got up to 35 degrees on the ground and hovered around 30 in the cockpit all day. It was a tough day, climbs would peak at 3-4 knots but most of the time you had to take 1s and 2s before moving on. 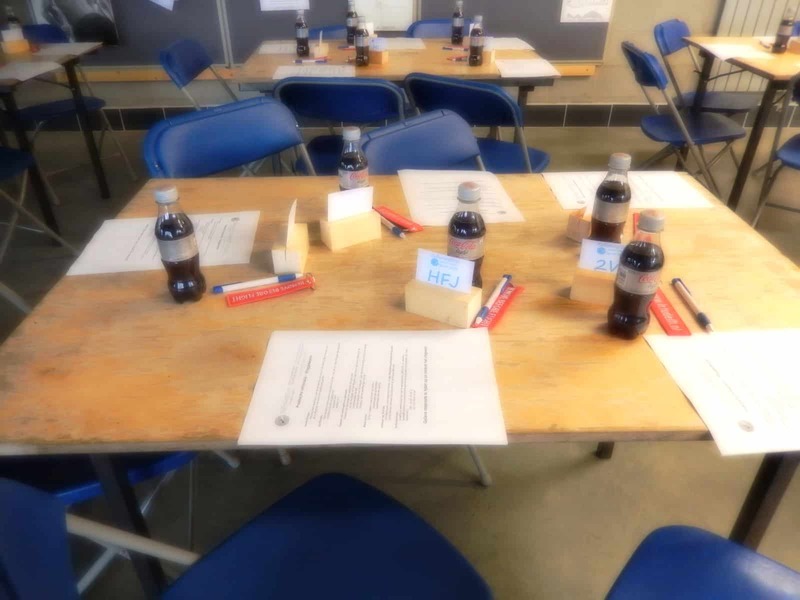 We played the tactical game yesterday, sitting in the start zone with our main competitors, the Germans, French, and Dutch. We were all in one huge gaggle on the start line and little groups kept peeling off to start but we waited and waited and waited and so we didn’t get swallowed up by the gaggle as soon as they left. We were steadily descending so eventually we decided to cut our losses and just make a break for it. We had an OK first leg, staying ahead of the gaggle who inevitably started two minutes after us. The second leg started to go to worms. Sam had 1,000ft more than us, so pushed off ahead. Unfortunately it wasn’t a day to be alone and he struggled, eventually landing out. Luke and I were at the front of the gaggle with the Dutch and had a fairly long glide to a forested area, where I managed to climb but Luke missed the bubble from 200ft below. He then got swamped by the gaggle and couldn’t climb away. I was gutted for the lads but just kept plugging away, and started team flying with Boyd, our token American. Soon the whole gaggle was together and we steadily made our way to the final turn. By this point we’d reached the forecasted day cut off at 17.30. 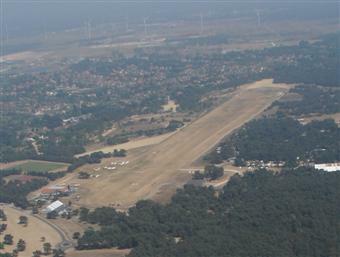 35k out, and 3,000ft over the airfield, we took what turned out to be the last climb of the day and set off for Leszno. I expected to bounce the next thermal marked by the guys lower than me ahead but we ended up running in silky smooth air. I came all the way back at 55knots and was about 100ft over the finish ring, so it was a pretty fine margins! 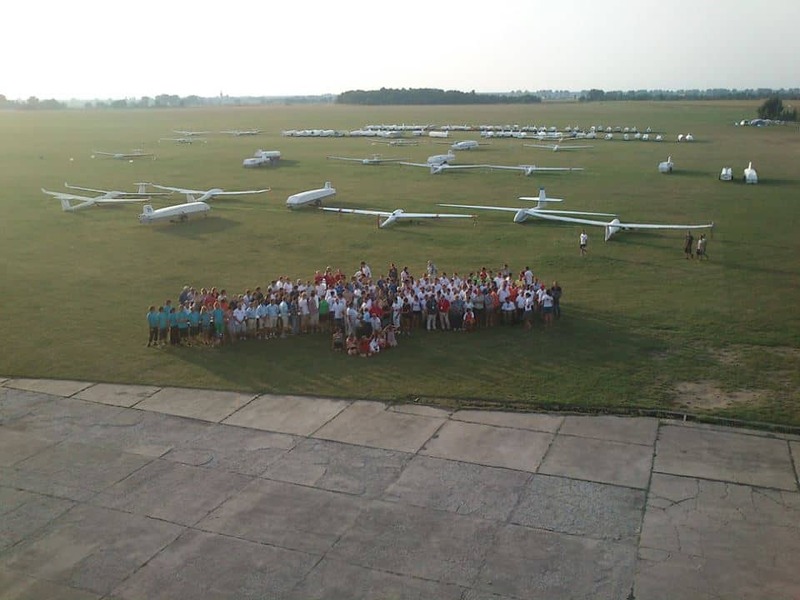 Lots of people landed short or finished too low so I was a very happy boy to be sat on Leszno airfield! These tactical games are stupid, but they’re part of the international game. Just by looking at the results you can see we got stuffed by the day winners, simply because we waited too long to start. The overalls, however, show that I came home with all the people around me, so I haven’t lost any points to the leaders, and these tricky days are all about conserving your position. There is life as well outside Leszno, as you can read in the JS news. “Today JS reached a new milestone: the roll-out of the 50th JS1-Revelation. Serial number 1C-050, belonging to Mr Bill Gawthrop from the US, is fully equipped with both 18m and 21m span tips and the M&D TJ-42 turbine engine. Congratulations to Uys and Attie and their team. AND a nice new record in Holland yesterday; a declared 700 k. in open class ;107 km./h. By Max Leenders and Bas Krebbers, good on them! As shared by Max and Bas. Extra edition on Friday; Mengen finished and Leszno continued with 2 days of soaring in both classes! Waiting! TC Bob from the UK. It was a long “wait” again on Wednesday as the wind was tough with 25 kts. and some showers from Germany had to pass by first. Launches were postponed till 2 PM. “What did we do today ? You can’t say they did NOT try. A pity though , but we could already see that the good weather was around the corner!!!! So both classes cancelled on Wednesday. After pin pong swimming and afternoon naps, video/movie time for a chance! At least the bird will fly today !!!!! Thursday; yesterday there were high and well-founded expectations for flying in both classes; the meteo maps looked good and as said before , “it was promised”. So tasks in BOTH classes 249 for club class as A and a B task for “when necessary”, not smaller BUT bigger 260! It turned out to be the 249km. task and that was already pretty difficult for some; 5 outlanded! 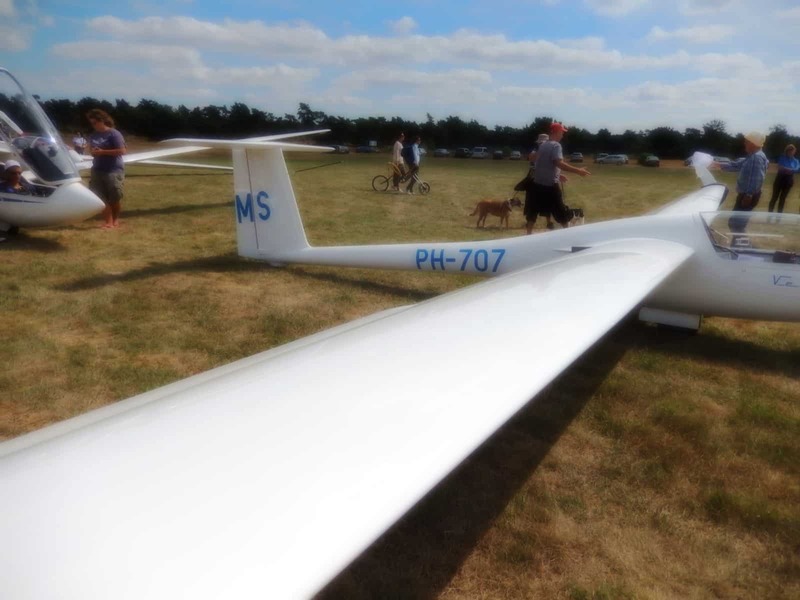 One of the Dutch gliders. 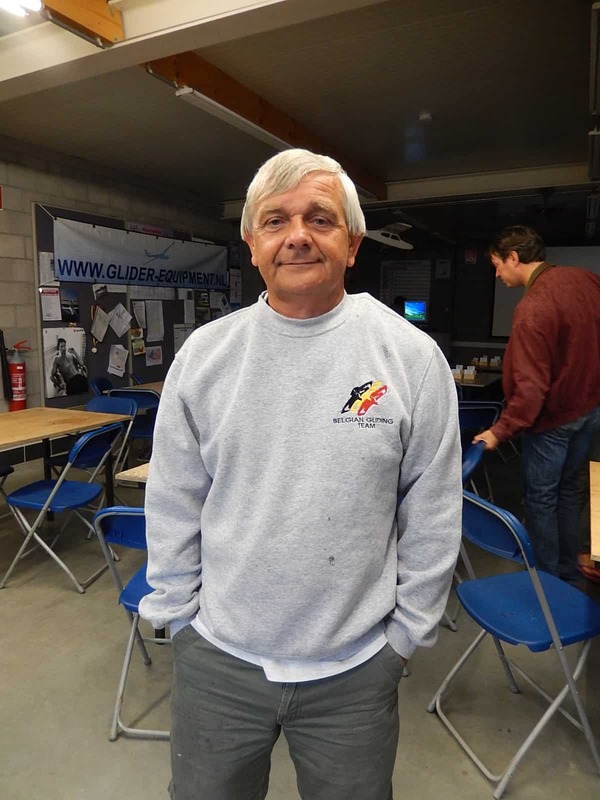 French pilot Benjamin Vades won the FIRST day from the JWGC in club class and got 809 points. In the top 10, 3 French pilots, 2 Dutch, 3 German and 2 Italian pilots. Standard class got a 3.15 AAT [ 290.9km/467.9km (375.5km)] was 3.30 first and 9 pilots did not finish! It was a Swedish pilot who won the 2 day of this class; Simon Landquist. Good on him!!! He flew 337 km. in 3.16, speed 103 km./h. 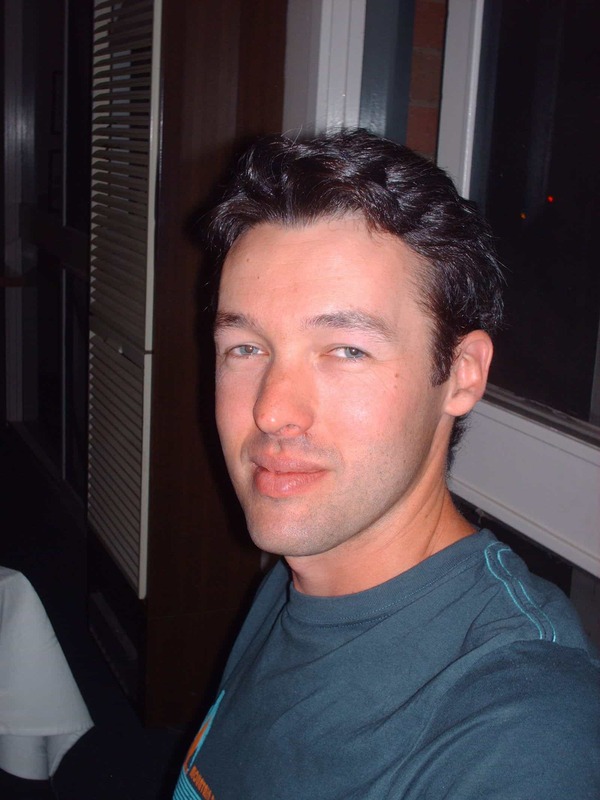 Peter Svoboda was 2d and Peter Millenaar 3d. He leads overall after 2 days with 12 points on Simon and Peter S. is 3d. Nice air shot as see on the Dutch site. ” It was n’t exactly the epic day we were hoping for” UK team. “Our Juniors had a very difficult day, all had difficulties getting up to comfortable altitude and missed the good startwindow. When they got past the startline, it was already too late. 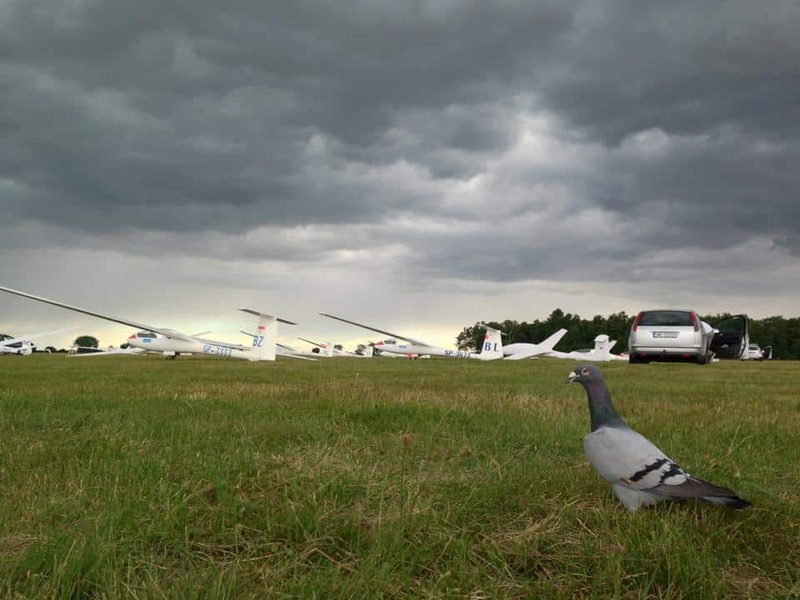 Weather deteriorated and they never got back in their rhythm” Belgium team. The day finished with the INTERNATIONAL EVENING, always a top event. Eager to see who comes in first. UK team and Dutch team…..POMMIES AND CLOGGIES…. friends as long as I am in gliding. Standard class 372 racing task. A task changed later into B task, same distance but they stay more to the East. 18 Minutes after 1 PM the lines were open for both classes! Long day for the clubbies! 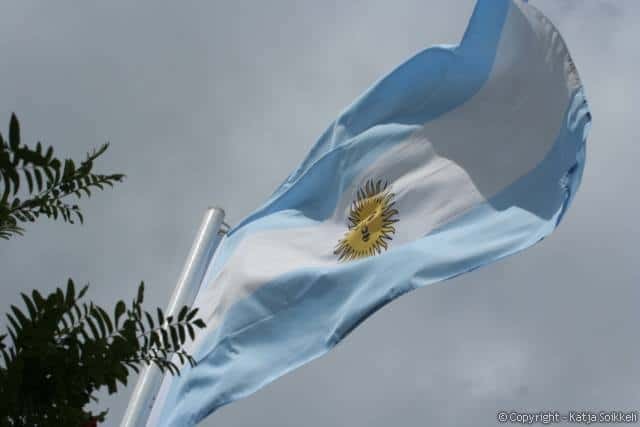 AND a BLUE day! Dry thermals, not for everybody easy, but clouds in the East. Lift about 1.5 average in the beginning up to 1300m. , and as expected with a blue sky ….gaggles! Some need more naps ,some concentrate on the “job in the office”. Nice Libelleke and where would we be without the TUGGIES!!!! Well ,….on the hottest day in 5 years here in Holland, I tried to keep an eye on “things”. Good day in Leszno. Peter S. [Czech Rep] won the day whilst Peter M. [Holland] was runner up… talking standard class. After 3 days Peter M is on top , Peter S on a 2d spot and Jacek from Poland on 3. AND,…don’t underestimate the German boys Enrique and Alexander busy after a bad first day on a race to the top. On a blue day you should not miss the boat by doing too much alone. By the way, Ingo Renner was one who had no problem with that!!! But that’s history for these young ones! So gaggles till the end as you can see on a great picture by Jacek Lewinksky as shared by Patrick Stouffs. By the way,….what a great photographer!!!!! 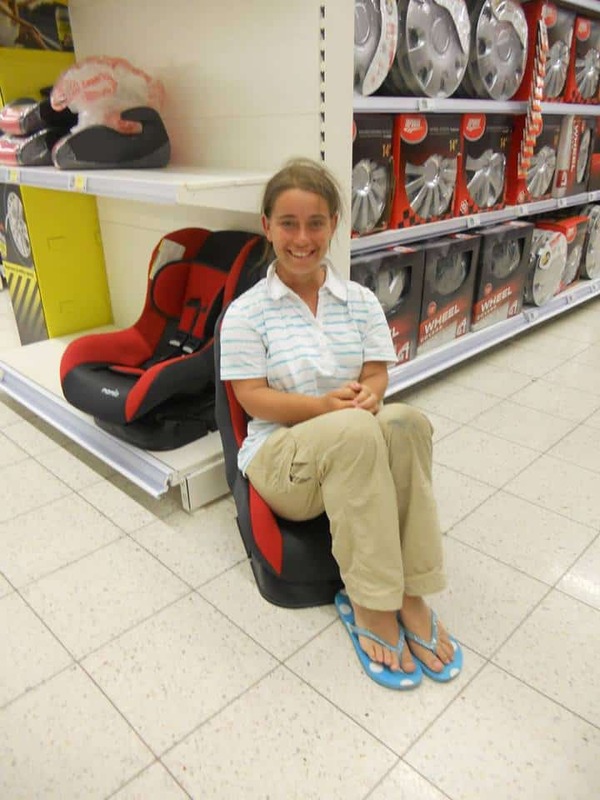 you have to double click to really see this picture! The clubbies had a big and long day! But ….they were ready for it. 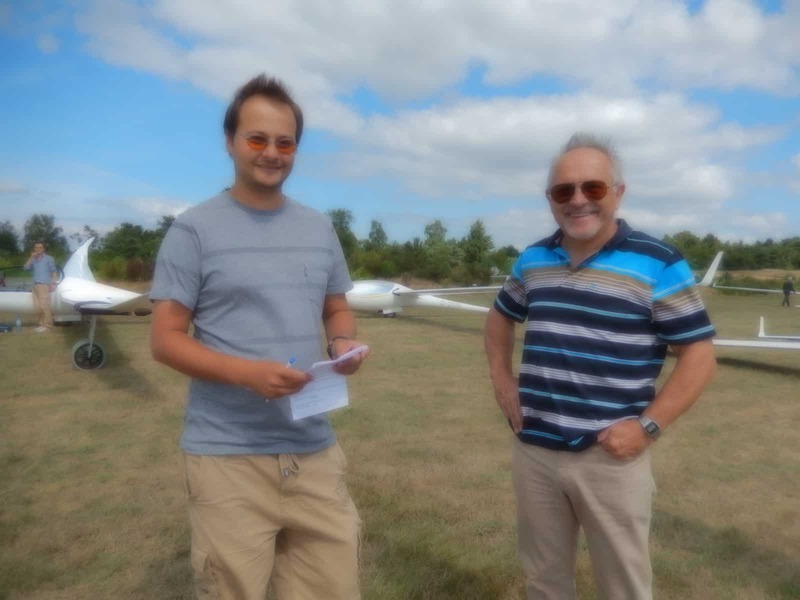 Luke Dale [ family from G Dale] and Matthew Davis [son from Andy, if I remember well] from the UK, had a great day flying together and “deserving” the 1000 and 986 points; 330 km. in 3.57. 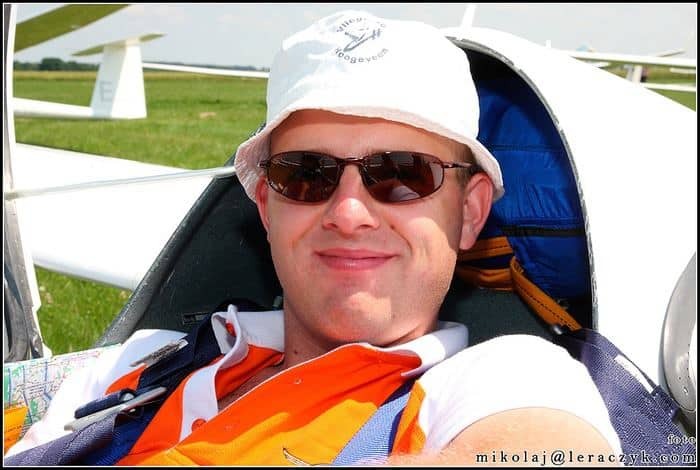 Another good Swedish pilot David Gustavson on spot 3 , Italian pilot Claudio on 4 and then Ard, Nick and Stefan from Holland with Jeroen from Belgium in his libelle on spot 8 with more kilometres but also [much] more time;4 hours 32. 3 Outlandings and 6 not yet scored. All scores of course preliminary. German team was happy, Dutch team was happy, UK team was happy, all “happy chappies”. Belgium mentioned “winning by not loosing”, so happy enough too!!! They were a bit more lucky in Mengen with the weather on Wednesday. Not that it was SUPER, but good enough for a speed of 124 km./h. for Michael who won the day with 410 km. in 3 hours 18. As said they had 2.30 and 3 hour AAT’s and the day turned out much better than hoped for/forecasted. Runner up was Tassilo. who flew together with Michael. They started both reasonably late at 12.22 [only Patrick Puskeiler started later at 13.06 but ended up on an 18th spot.] and finished together 1000 and 990 points for the day. A bad day unfortunately, for Uli who finished as number 23 but still is on spot 2 overall, with 33 points ahead of Tassilo AND young Patrick Gai was only ONE point behind Tassilo. All fly an EB version. 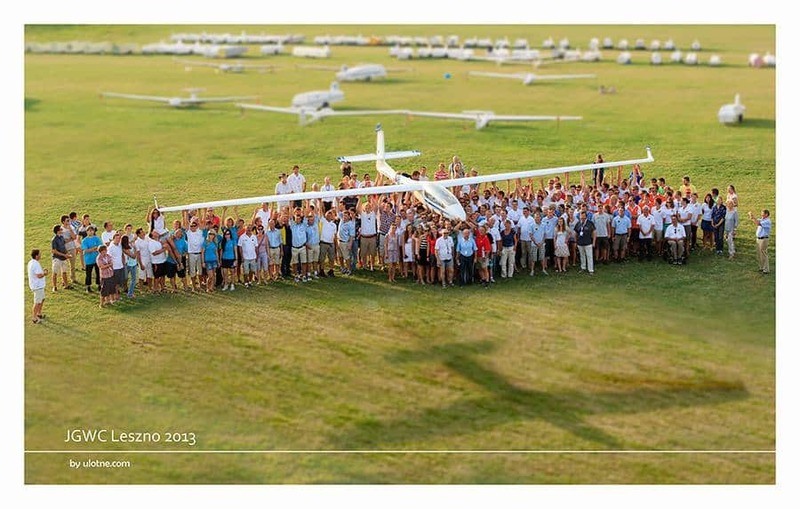 Nice to see Bruno [ Gantenbrink] is still competing too, he flies the ETA. 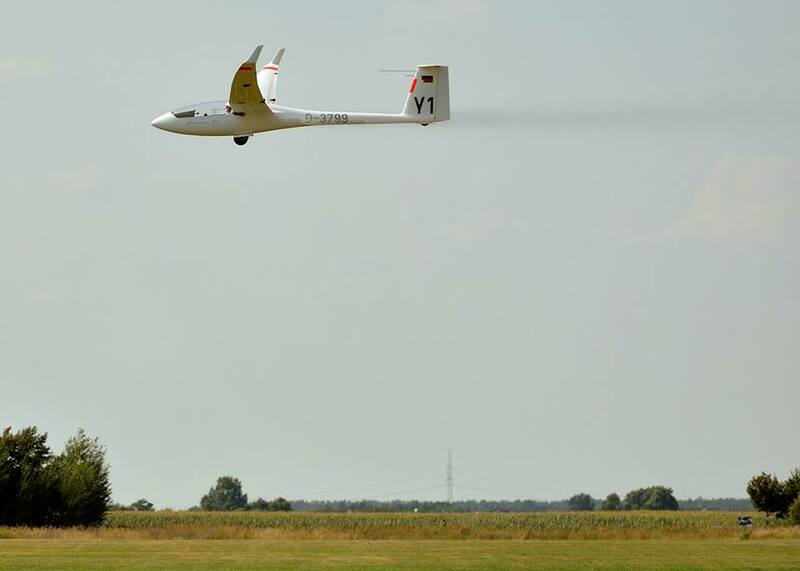 In 18 m. “only” 830 points for winner Sven Weiland [ASG 29 E] flying 314 km. in 2.34. Yves was on spot 3, but is still strongly leading the overall scores. Werner was on spot 13 , but was still on spot 4 overall behind Robert and Jean Luc. Only 2 days to go and they looked good! Thursday; yesterday 487 km for open and 463 for 18 m. that sounded better. Bleu thermals were predicted , but also occasional cu’s. Temperature 34 like we have in Holland today! In open Michael won again;906 points. Uli had 905 and Tassilo 902!!!! In 18 m. Robert was on a good 2d place , Yves at 5 and Werner at spot 9. FRIDAY LAST DAY!!!! Another HOT day , we all get nice warm tropical African wind bringing African temperatures. Last day had good tasks to make up for the 4 non flying days; a 3 hour AAT for open who started first and 2.30 AAT for 18 m.
So after 7 days nothing is decided in both classes. On this day 8 they all have to fight to keep their place or to get higher, though with 300 points ahead of Uli and 344 on Tassilo and knowing Michael, he would be absolutely not giving that away. Who wins the silver , who the bronze???? In 18 m. Yves will be most probably the WINNER , not the German Champion as he is from Belgium. So who will be the CHAMPION??? Robert  , Werner [ 4794] or maybe Claus Triebel ????? We’ll know later. At 13.24 the open class pilots could start, line was open. After winning day 2 Ewald Bombelka raced in his Nimbus 4 M over 349 km. in 3.17, so a 2d day-win. Patrick Puskeiler also in Nimbus 4 M was runner up, but both were not fast enough to make it difficult for Michael who is the new GERMAN CHAMPION with 7014 points. Good runner up Uli Schwenk with 6668 in the EB 29 and Tassilo is 3d with 6633 points. Bruno with the ETA finished on a nice 12th spot. Young Patrick ended on 7 overall, loosing 105 points today with a 16th place. In 18 m. Claus Triebel won the day with 289 km. in time 2.34. 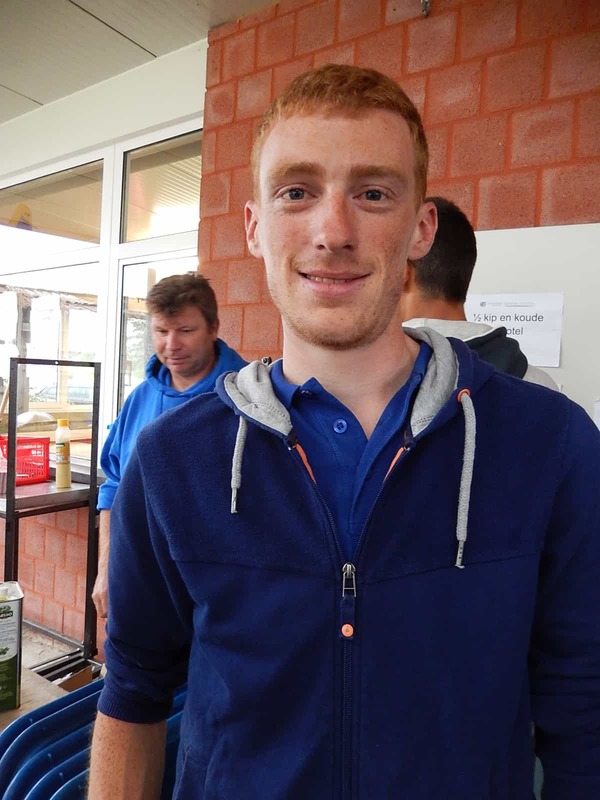 Robert was 2d so he will be the new NATIONAL CHAMPION in 18 m. Yves , from Belgium, won however, with 5939 points. Robert had 5707 and Werner Meuser still going strong, is on spot 3 with 5566 and Claus on 4 with 5489. Interesting competition AGAIN to follow!!! No more words needed! Maybe only who did it? David Jansen, who flew the last WGC in Uvalde , in the ASG 29E/18m. That’s it for today, do you know what’s VERY interesting…..the INTERNATIONAL HACKERS festival is here in Holland!!!! 3000 ” Nerds ” have their tents and laptops close to Alkmaar. Will be back on Monday , have Australian guests for the weekend, so will be busy!!! CU on Monday.